Recent photos from the Kentucky State Legislature are available for download below. Photos are attributable to "LRC Public Information". 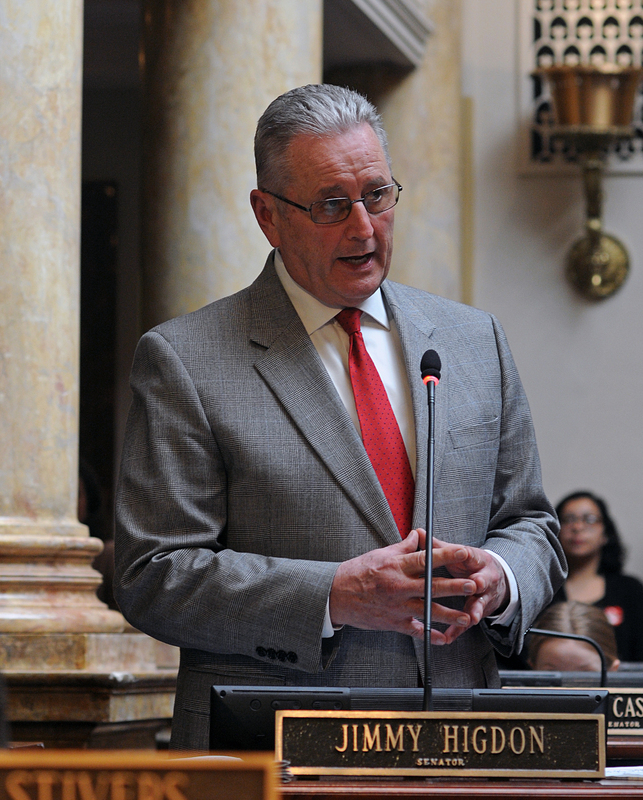 FRANKFORT, March 14 -- Sen. Jimmy Higdon, R-Lebanon, makes a motion that the Senate members concur with changes made by the House to Senate Bill 57, a bill regarding expungement of certain class D felonies. 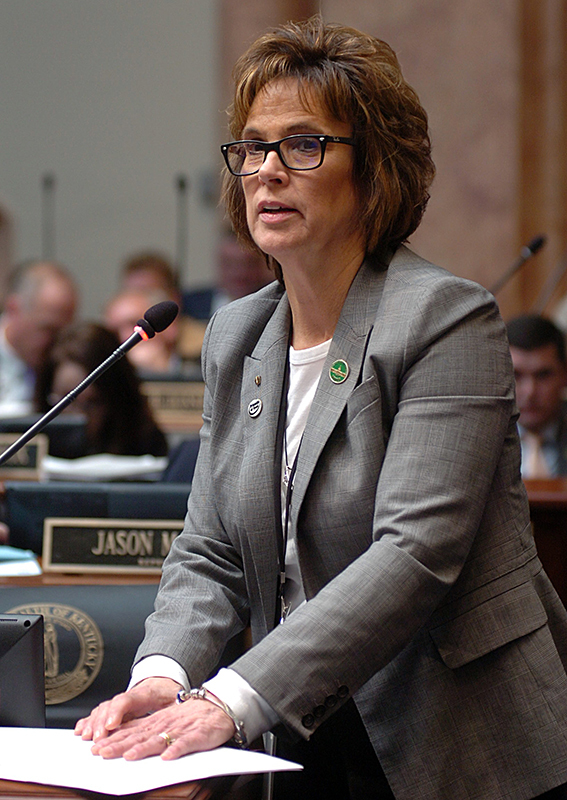 FRANKFORT, March 14 -- Rep. Cherlynn Stevenson, D-Lexington, comments on Senate Bill 70, a bill concerning strangulation, in the House. 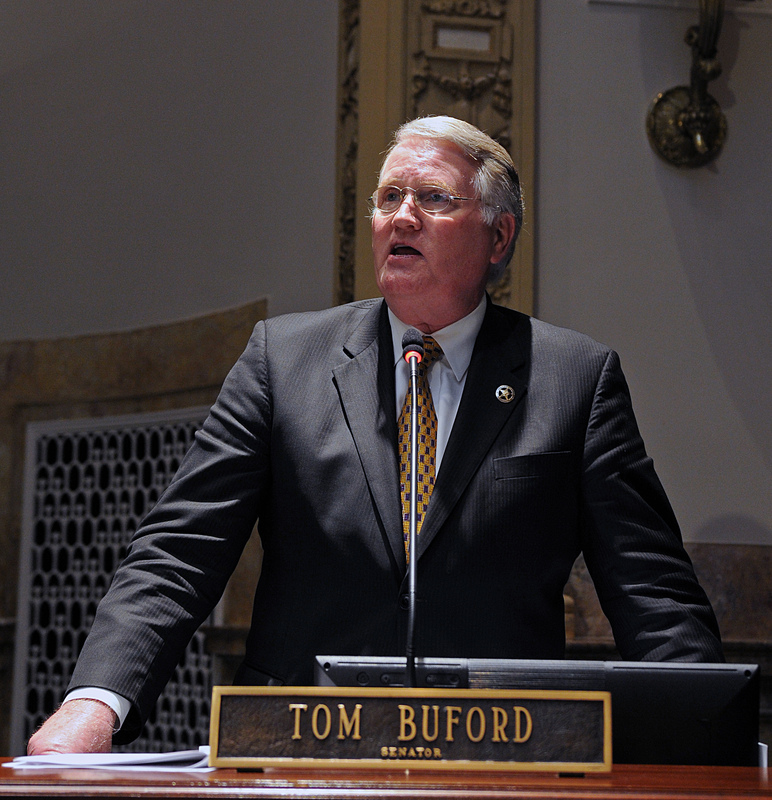 FRANKFORT, March 14 -- Sen. Tom Buford, R-Nicholasville, makes a motion that the Senate members concur with changes made by the House to Senate Bill 84, a bill regarding licensing of midwives. FRANKFORT, March 13 -- Sen. Paul Hornback, R-Shelbyville, speaks with Sen. Matt Castlen, R-Owensboro, at his desk in the Senate. 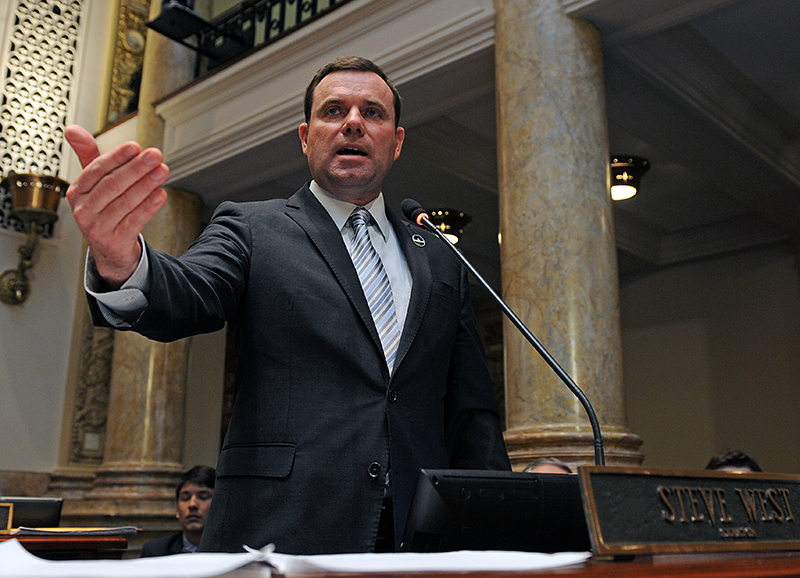 FRANKFORT, March 13 -- Rep. 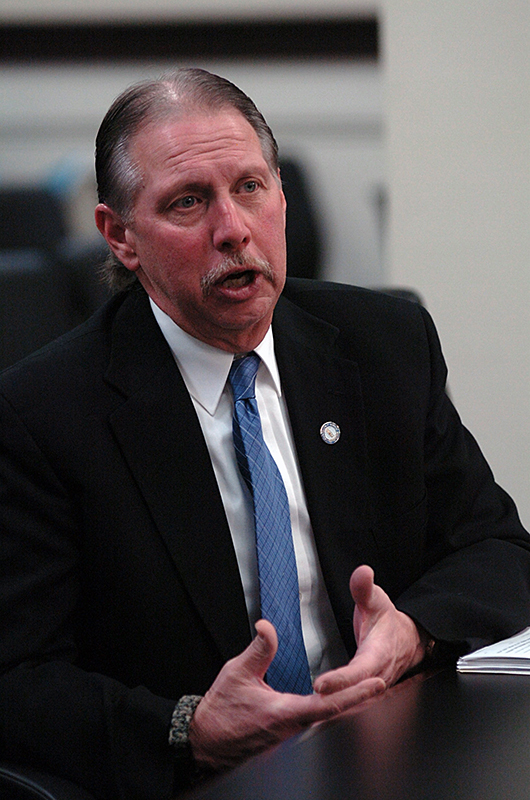 Rob Wiederstein, D-Henderson, expresses his concerns on House Bill 354, a bill relating to taxation, in the House. 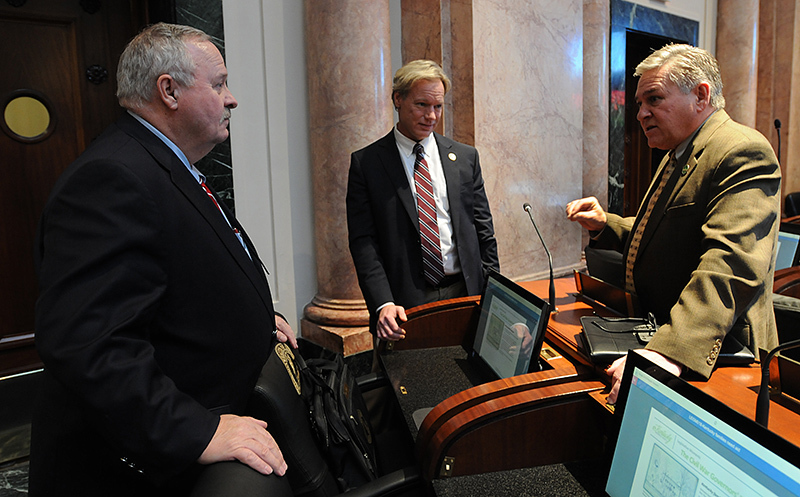 FRANKFORT, March 13 -- Sen. Christian McDaniel, R-Taylor Mill, speaks with Senate President Pro Tem David P. Givens, R-Greensburg, at his desk in the Senate. 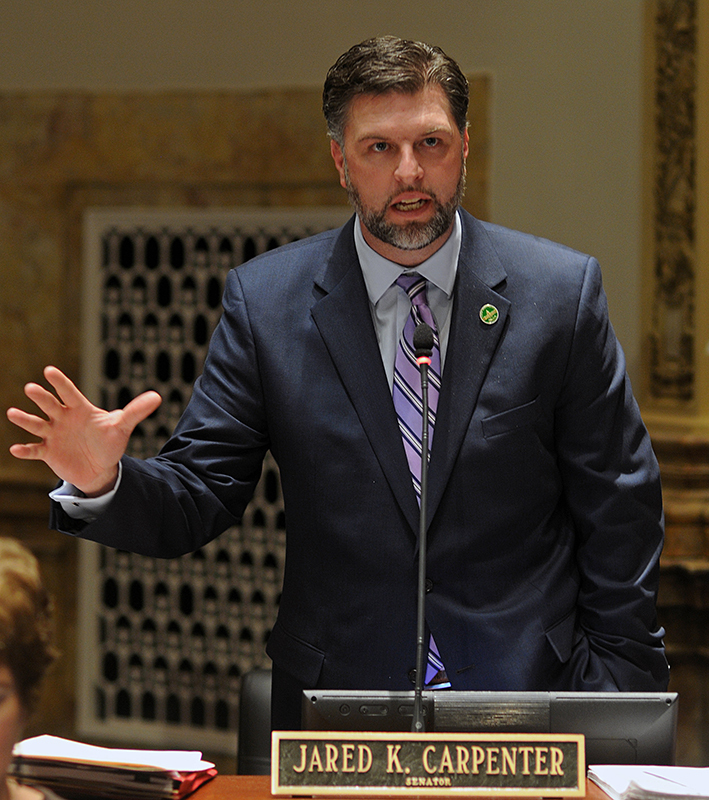 FRANKFORT, March 13 -- Sen. Jared Carpenter, R-Berea, comments on House Bill 354, a bill relating to taxation, in the Senate. 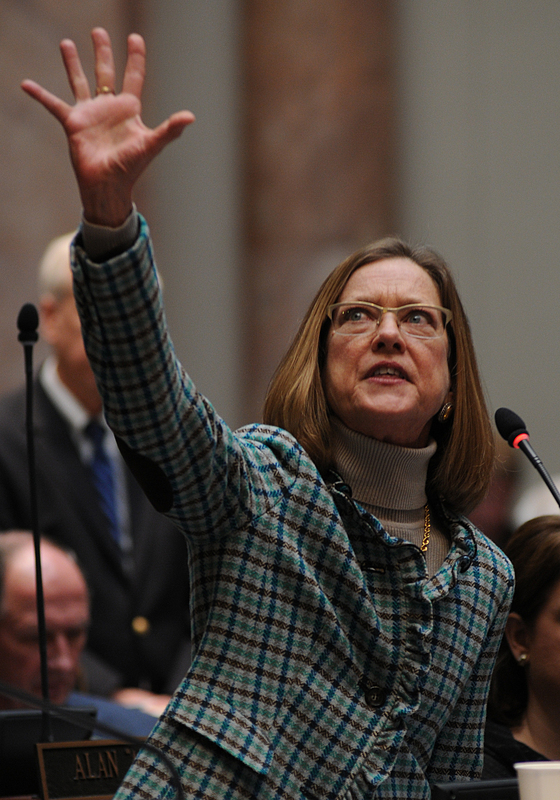 FRANKFORT, March 13 -- Sen. Robin L. Webb, D-Grayson, comments on House Bill 354, a bill relating to taxation, in the Senate. 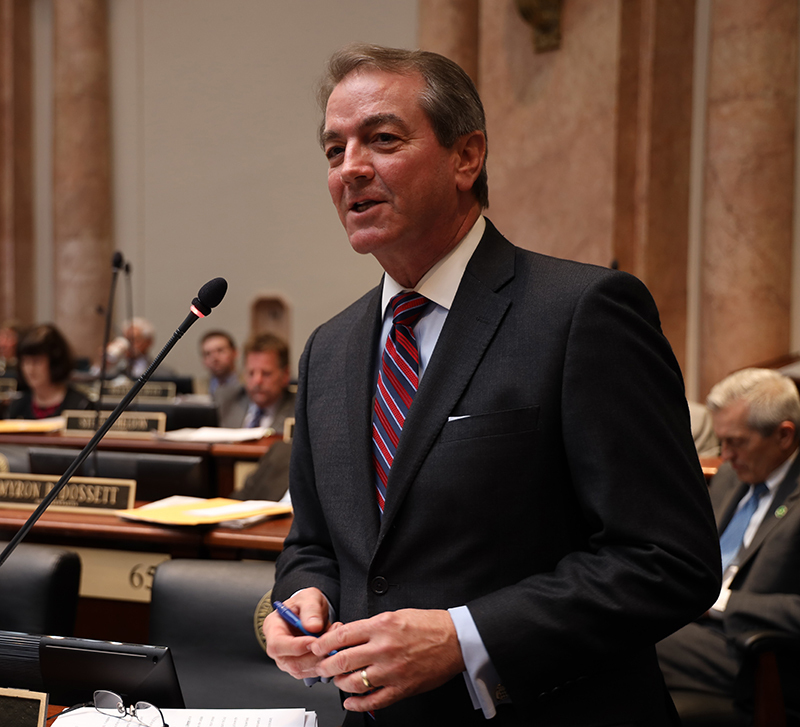 FRANKFORT, March 12 -- Speaker of the House David Osborne, R-Prospect, presents House Bill 522, a bill relating to elections, in the House. 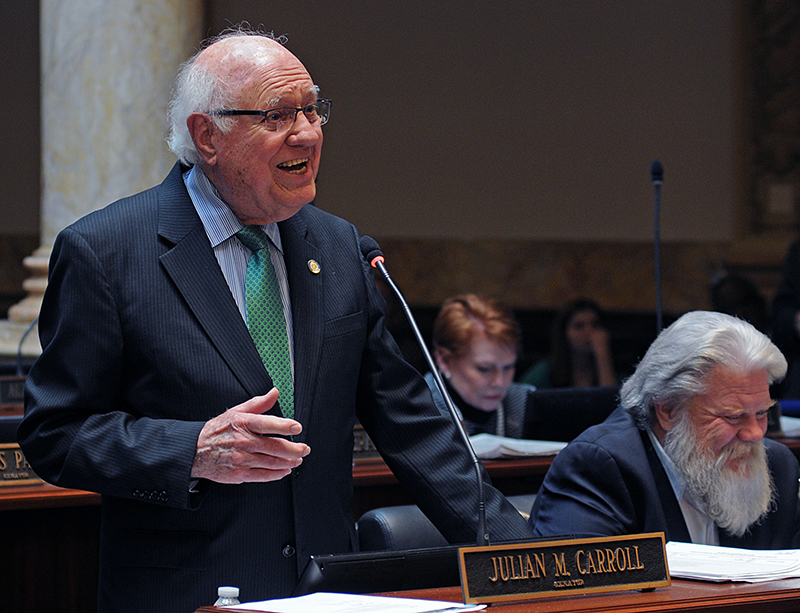 FRANKFORT, March 12 -- Sen. Julian Carroll, D-Frankfort, comments on House Bill 114, a bill relating to elections, in the Senate. 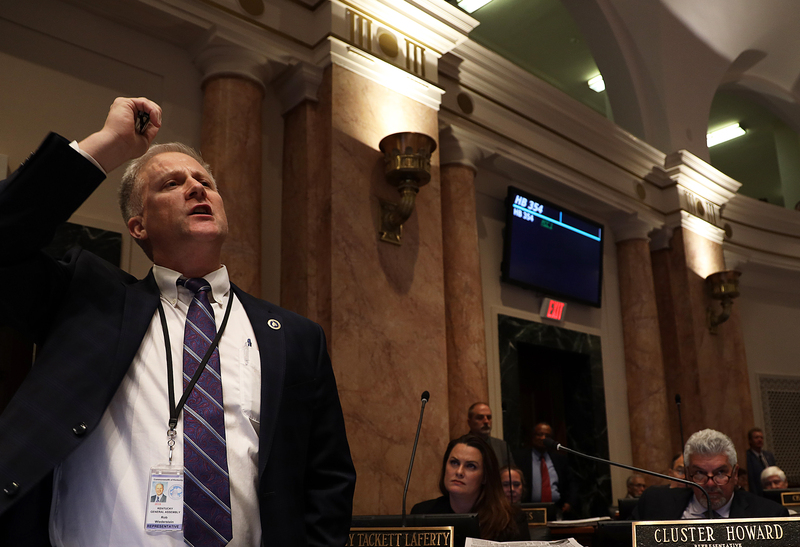 FRANKFORT, March 12 -- Rep. Charles Miller, D-Louisville, comments on Senate Bill 250, a bill relating to public education, in the House. 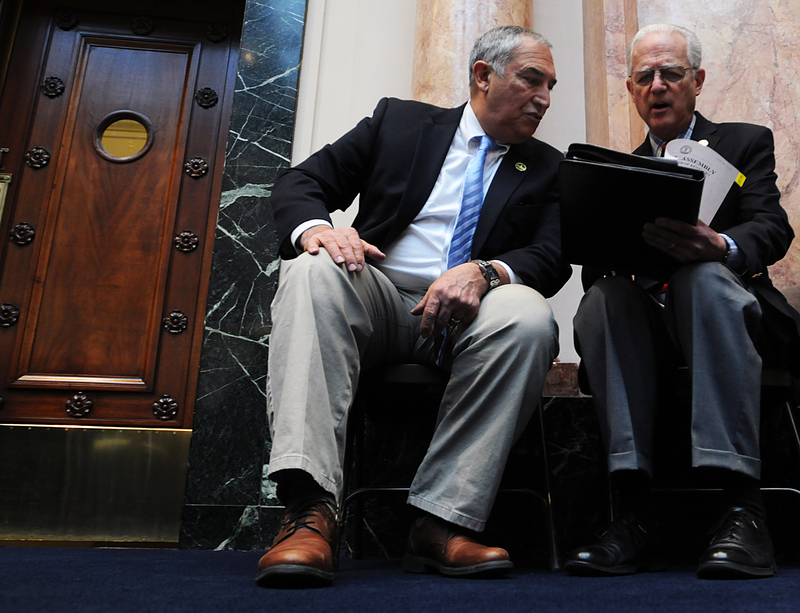 FRANKFORT, March 6 -- Ted Sandmann, (left) father of Covington Catholic High School student Nick Sandmann, sits with Sen. Wil Schroder, R-Wilder, as Schroder presents Senate Bill 240, a bill that would prohibit disseminating personally identifying information on the Internet about a minor with the intent to intimidate, abuse, threaten, harass, or frighten. 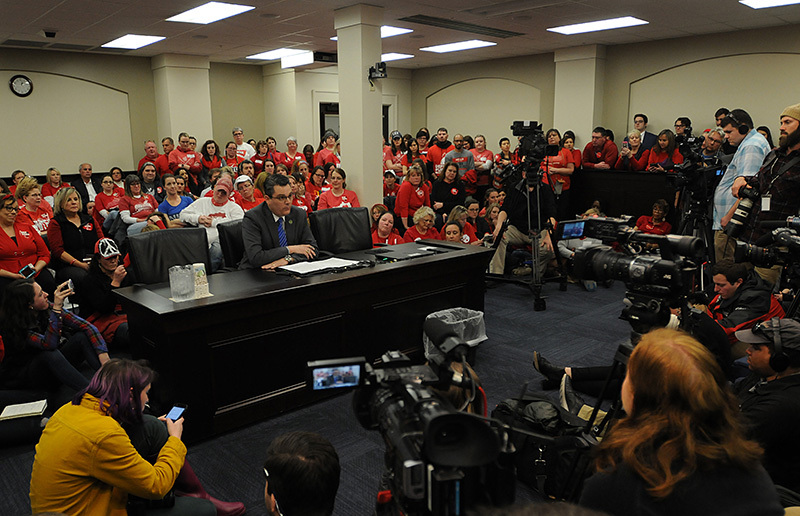 Mr. Sandmann testified in favor of the bill. 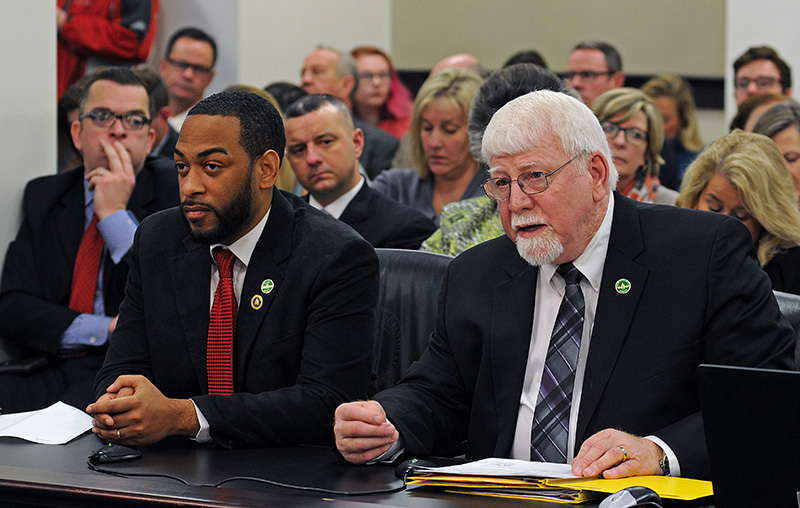 FRANKFORT, March 6 -- Rep. Charles Booker, D-Louisville, (left) sits with Rep. Danny Bentley, R-Russell, as Bentley presents House Bill 64, a bill allowing pharmacists to dispense a prescription without authorization by the prescribing practitioner in an emergency situation, in the Senate Health and Welfare Committee. 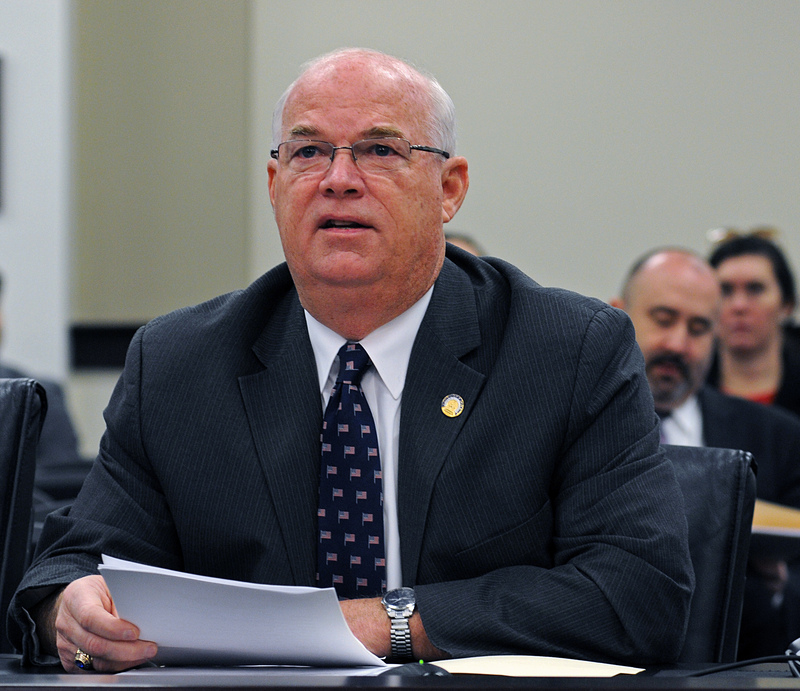 FRANKFORT, March 6 -- Rep. Steve Sheldon, R-Bowling Green, presents House Bill 218, a bill relating to dialysate solutions and devices, in the Senate Health and Welfare Committee. 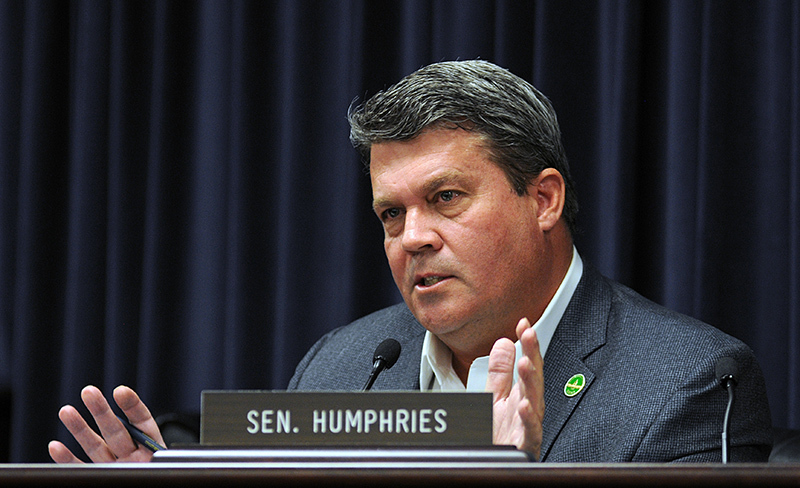 FRANKFORT, March 6 -- Rep. John Sims Jr, D-Flemingsburg, presents House Bill 282, a bill relating to airports, in the Senate Transportation Committee. 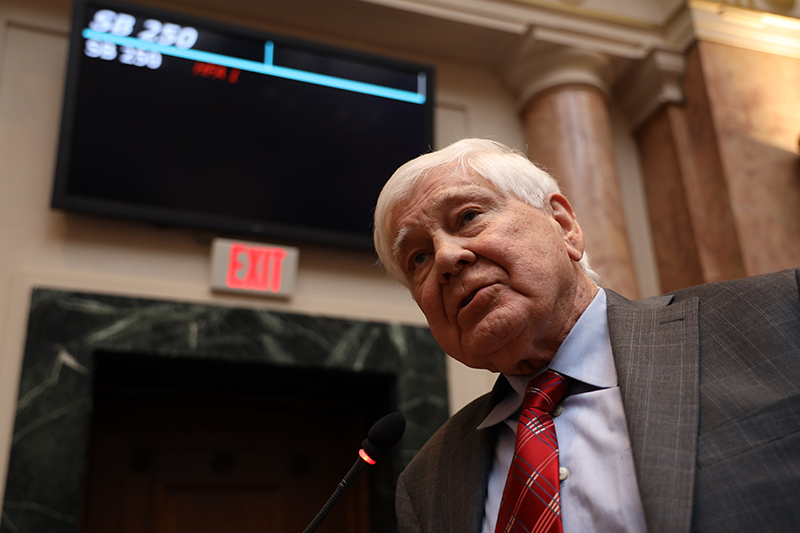 FRANKFORT, March 6 -- Rep. Myron Dossett, R-Pembroke, presents House Bill 114, a bill relating to filing deadlines for elections, in the Senate State and Local Government Committee. 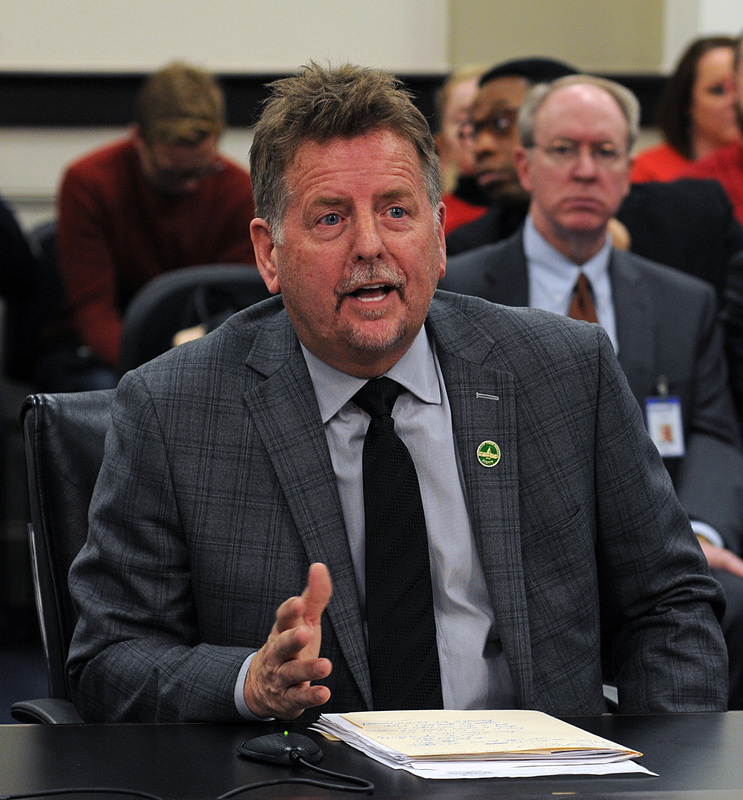 FRANKFORT, March 5 -- Rep. Michael Meredith, R-Oakland, presents House Bill 285, a bill relating to consumer loan companies, in the Senate Banking and Insurance Committee. 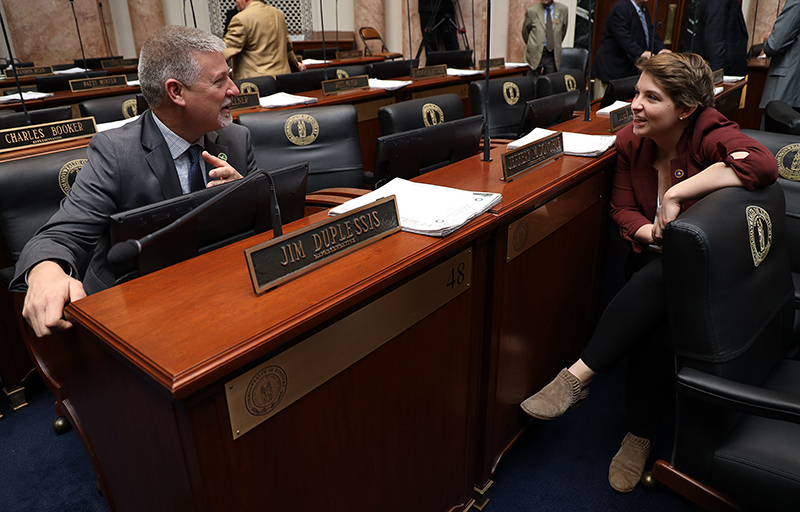 FRANKFORT, March 5 -- Rep. Jim DuPlessis, R-Elizabethtown, (left) speaks with Rep. Josie Raymond, D-Louisville, during a recess of the House. 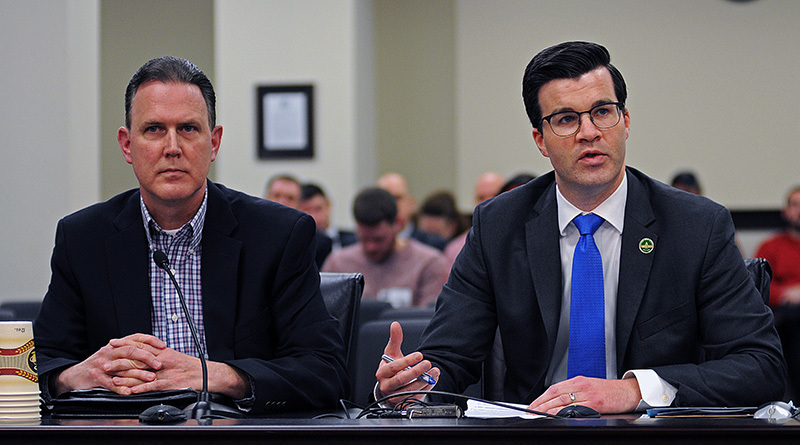 FRANKFORT, March 5 -- Rep. Adam Bowling, R- Middlesboro, presents House Bill 396, a bill relating to expansion of health insurance options, in the Senate Banking and Insurance Committee. 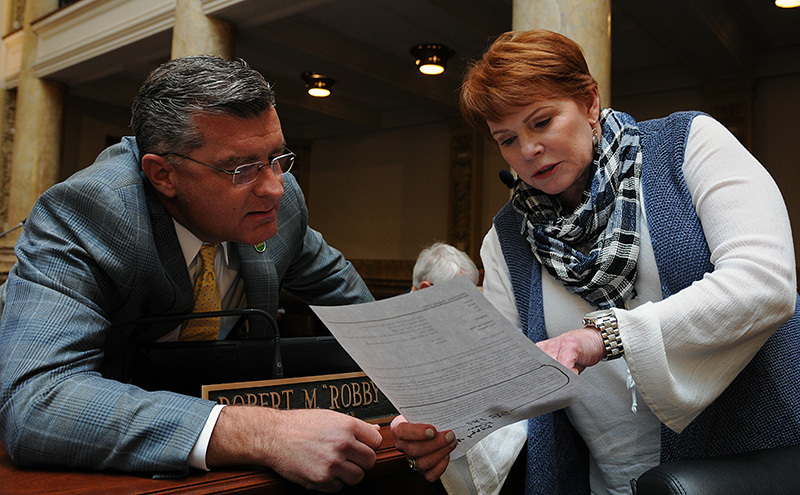 FRANKFORT, March 4 -- Sen. Robby Mills, R-Henderson, (left) discusses a bill with Sen. Denise Harper Angel, D-Louisville, in the Senate. 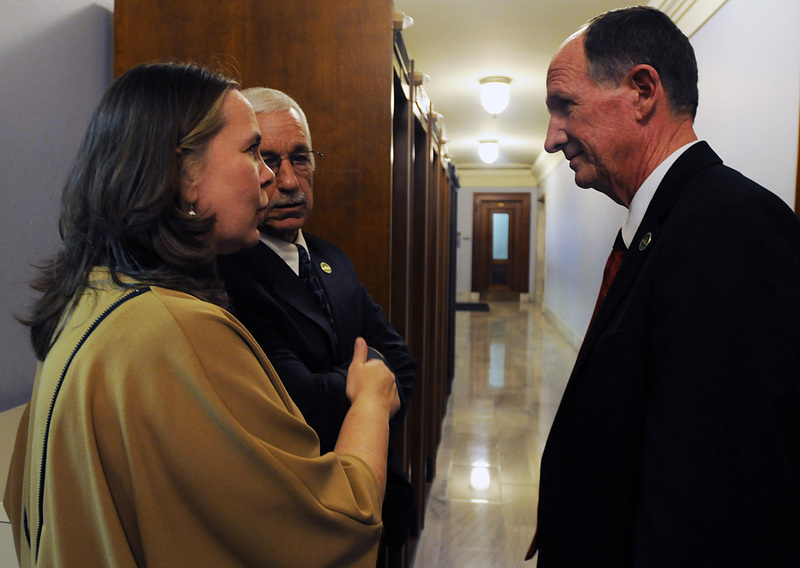 NKFORT, March 4 -- Rep. 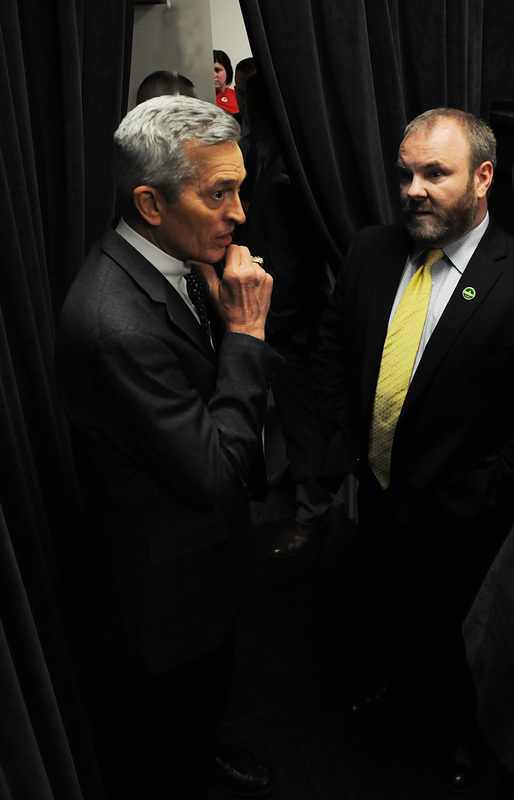 Rob Wiederstein, D-Henderson, (left) speaks with Rep. Dennis Keene, D-Wilder, in the House. FRANKFORT, March 1-- Rep. Savannah Maddox, R-Dry Ridge, presents Senate Bill 150, a bill that would allow concealed carry of deadly weapons without a license, in the House. 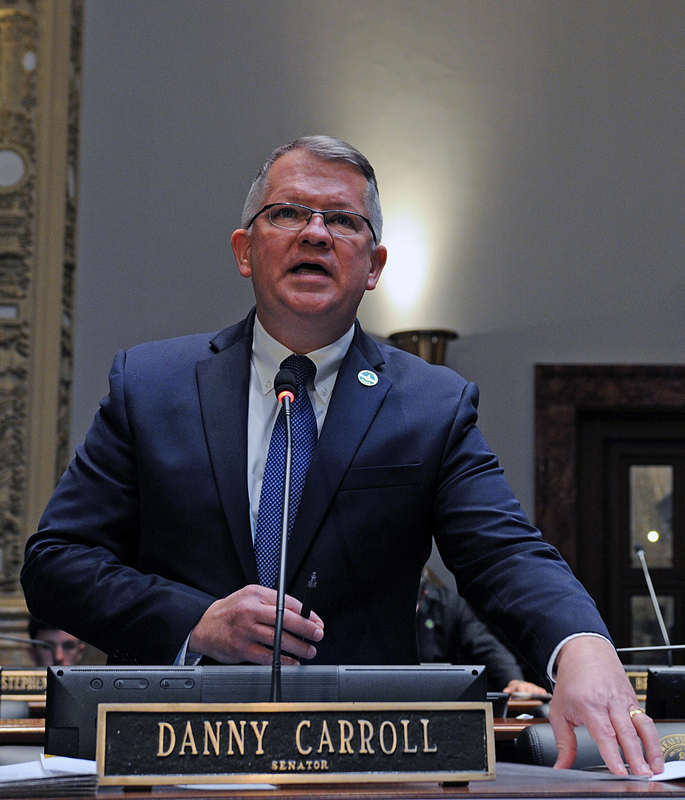 FRANKFORT, March 1-- Sen. Danny Carroll, R-Paducah, presents Senate Bill 128, a bill relating to assisted-living communities, in the Senate. 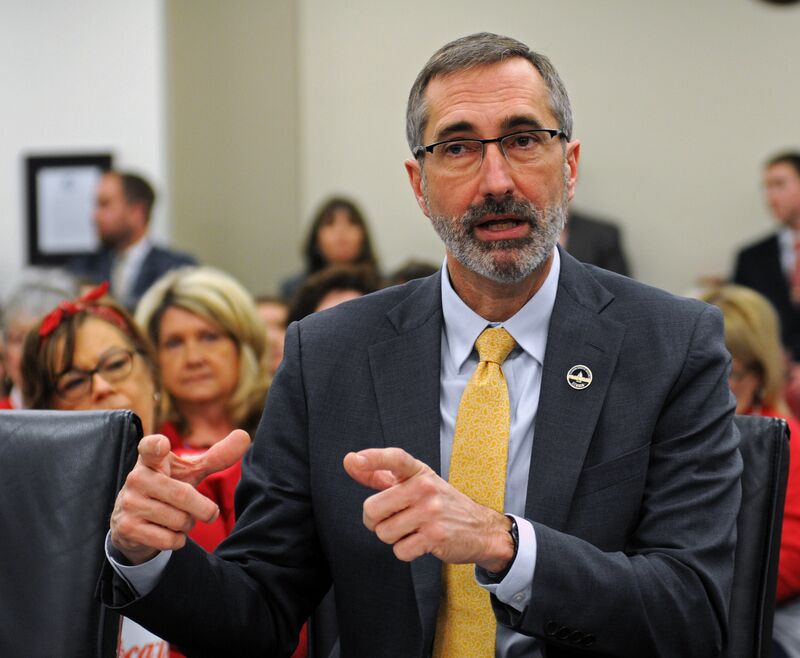 FRANKFORT, February 28 -- Rep. Ken Upchurch, R-Monticello, presents House Bill 525, a bill relating to the Teachers' Retirement System board of trustees, to a packed room in the House State Government Committee. 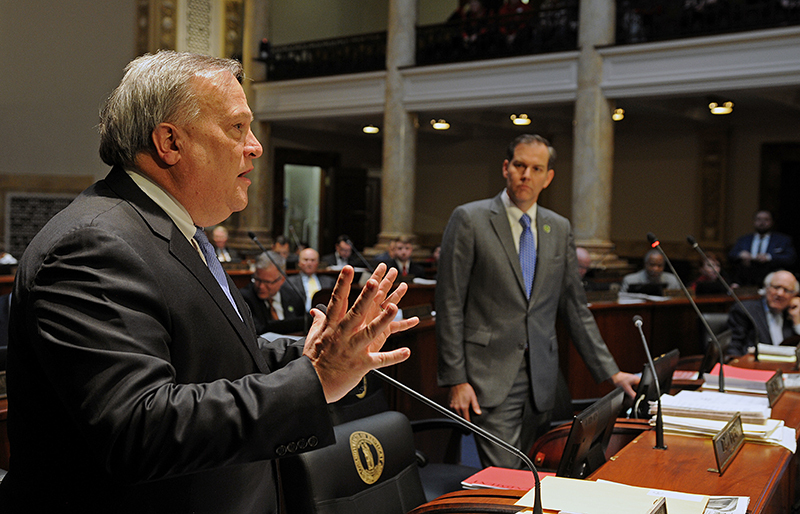 FRANKFORT, February 28 -- Senate President Robert Stivers II, R-Manchester, commends the bipartisan, bicameral effort that was put into final passage of Senate Bill 1, the School Safety and Resiliency Act, in the Senate as the bill’s sponsor, Sen. Max Wise, R-Campbellsville, watches. 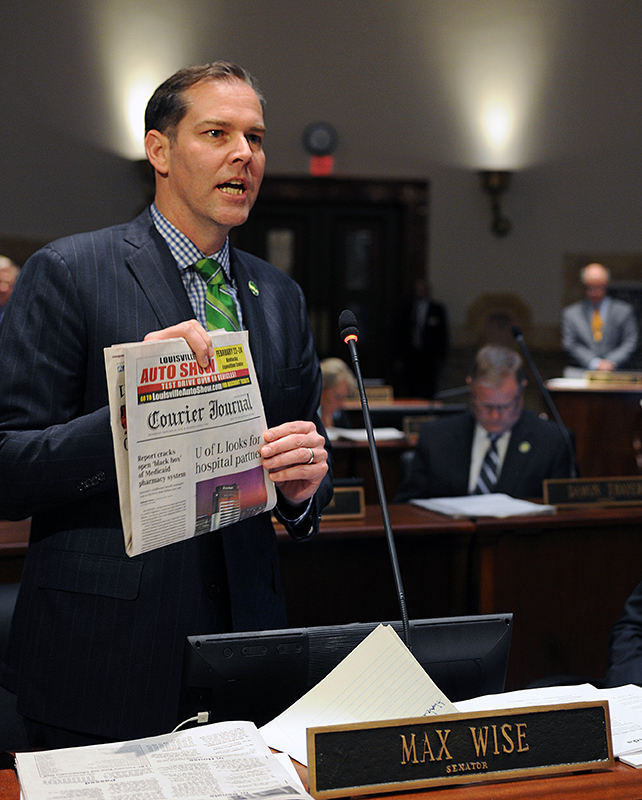 FRANKFORT, February 28 -- Rep. Joe Graviss, D-Versailles, comments on House Bill 525, a bill relating to the Teachers' Retirement System board of trustees, in the House State Government Committee. 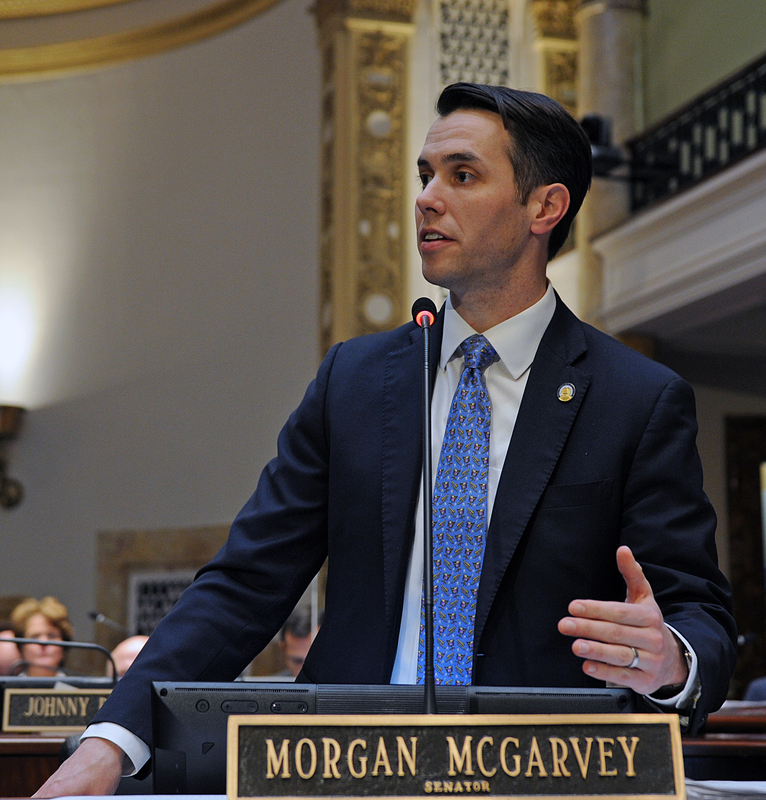 FRANKFORT, February 28 -- Senate Minority Floor Leader Morgan McGarvey, D-Louisville, presents Senate Bill 114, a bill relating to notarial documents, in the Senate. FRANKFORT, February 28 -- Rep. Patti Minter, D-Bowling Green, comments on House Bill 525, a bill relating to the Teachers' Retirement System board of trustees, in the House State Government Committee. 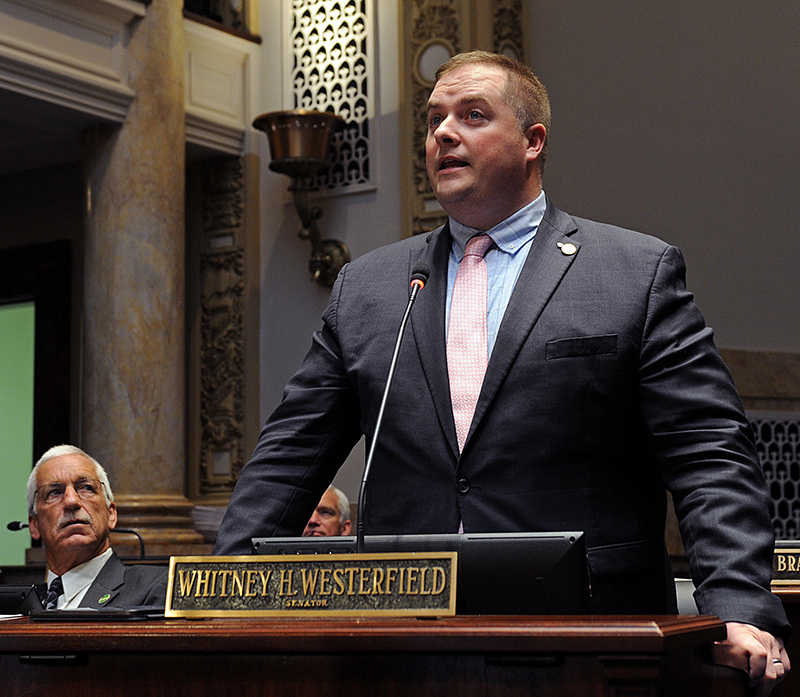 FRANKFORT, February 28 -- Sen. Whitney Westerfield, R-Crofton, presents Senate Bill 227, a bill regarding abortion and known as the Born Alive Infant Protection Act, in the Senate. 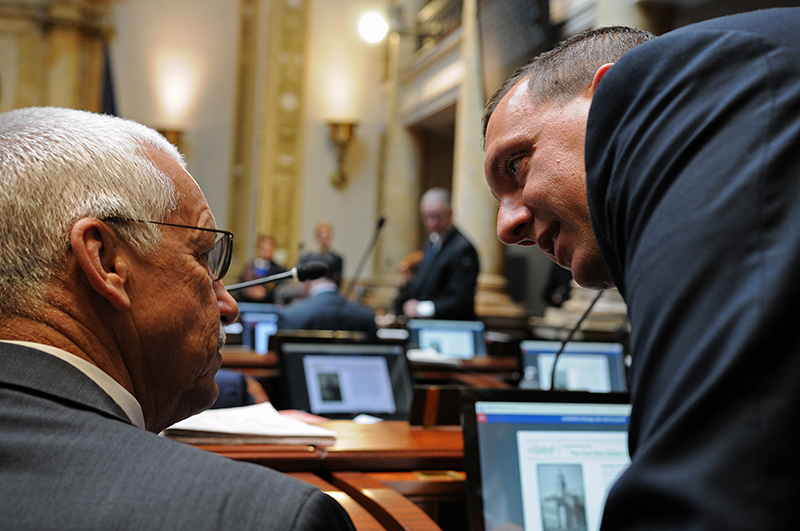 FRANKFORT, February 28 -- House State Government Committee Chair Jerry T. Miller, R-Louisville, meets with Rep. Jason Nemes, R-Louisville, in the back of the committee room before the meeting begins. 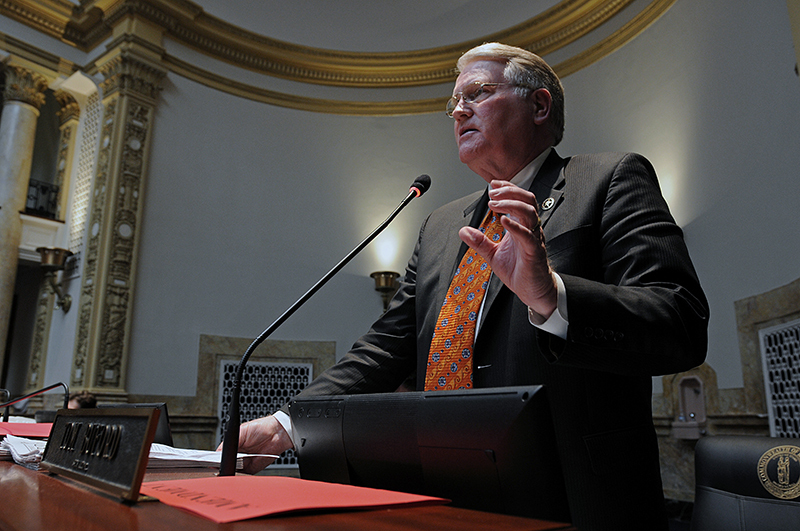 FRANKFORT, February 28 -- Sen. Stephen West, R-Paris, comments on Senate Bill 114, a bill relating to notarial documents, in the Senate. FRANKFORT, February 28 -- (left to right) House Majority Caucus Chair Suzanne Miles, R-Owensboro, meets with Sen. Paul Hornback, R-Shelbyville, and Rep. Richard Heath, R-Mayfield, outside of the House chamber. 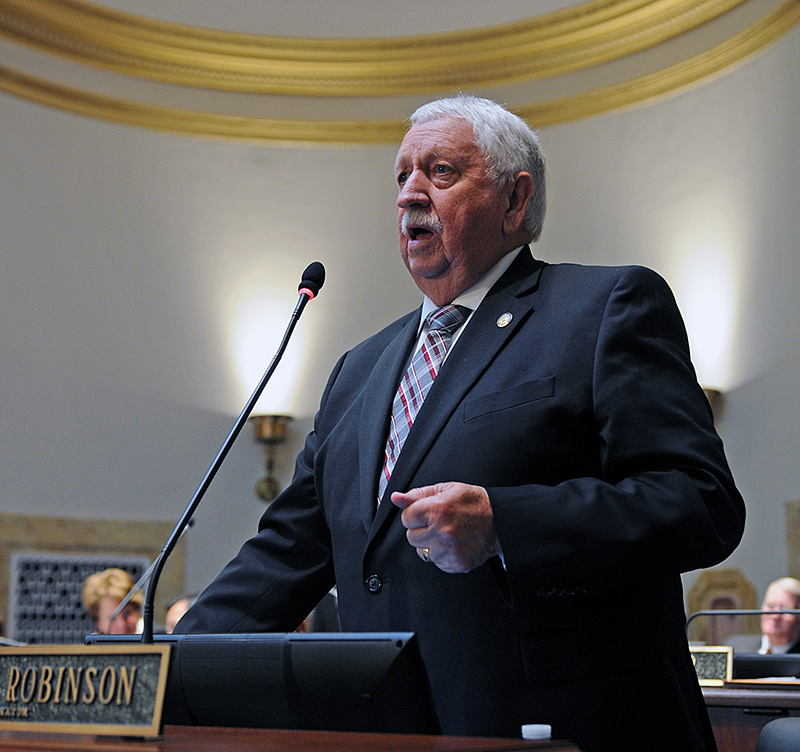 FRANKFORT, February 28 -- Sen. Albert Robinson, R-London, comments on Senate Bill 2, a bill allowing appointment of a special judge in certain civil actions, in the Senate. 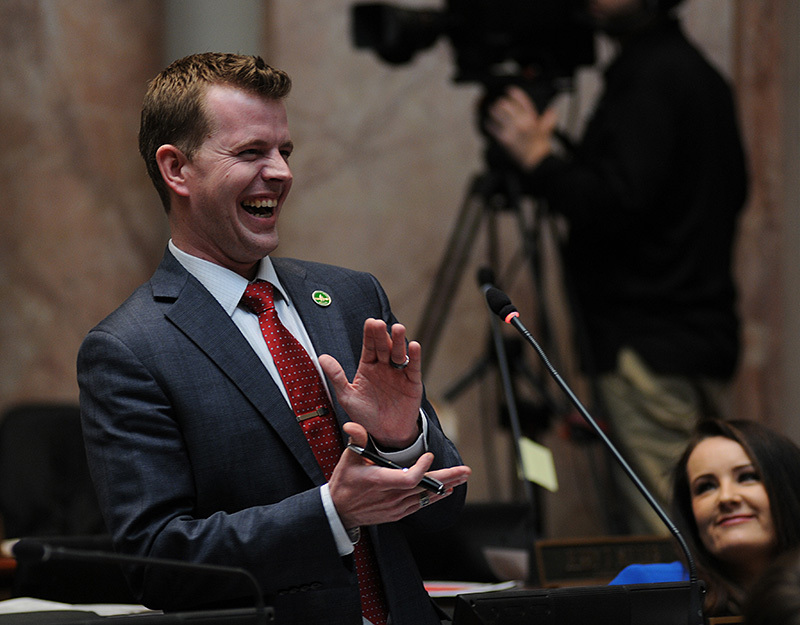 FRANKFORT, February 27 -- (left to right) Majority Floor Leader John Bam Carney, R-Campbellsville, acknowledges other legislators who worked in a bi-partisan manner to help pass Senate Bill 1, the School Safety and Resiliency Act. With Carney are Sen. Max Wise, R-Campbellsville, Rep. Brandon Reed, R-Hodgenville, Rep. George Brown Jr, D-Lexington, and Rep. John Blanton, R-Salyersville. 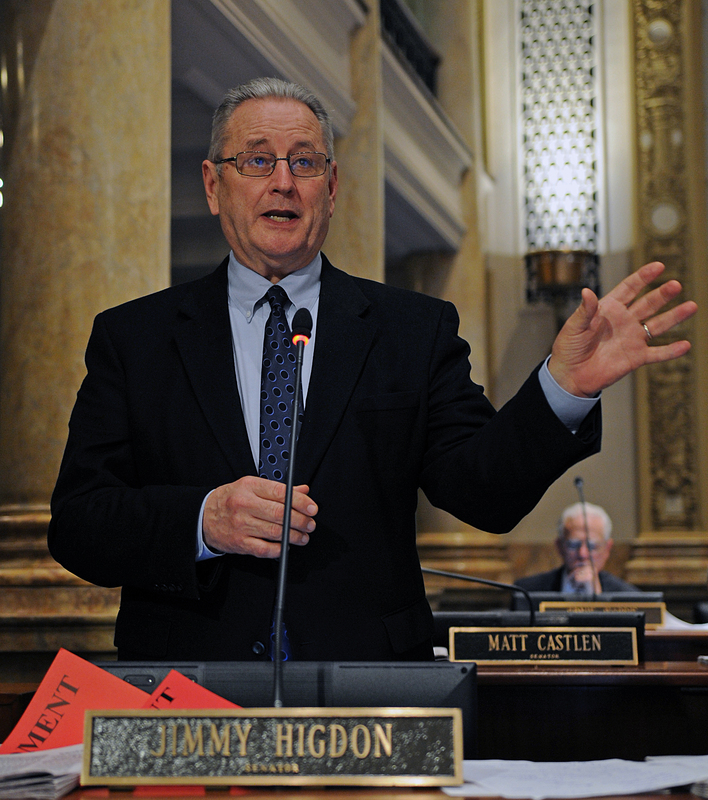 FRANKFORT, February 27 -- Sen. Jimmy Higdon, R-Lebanon, presents Senate Bill 57, a bill relating to expungement of felonies, in the Senate. FRANKFORT, February 27 -- Rep. Derek Lewis, R-London, celebrates the passage of his first bill, House Bill 244, a bill relating to fines for traffic violations in highway work zones, in the House. 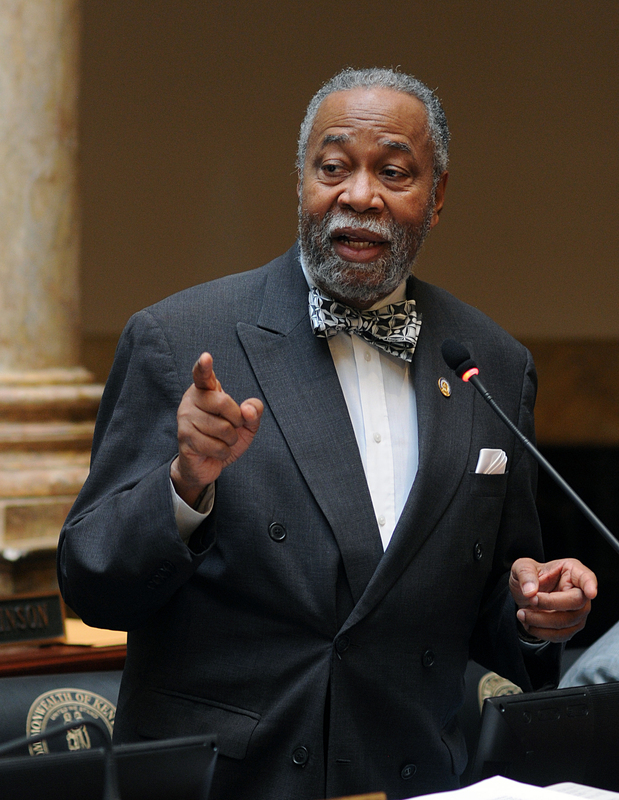 FRANKFORT, February 27 -- Sen. Gerald A. Neal, D-Louisville, offers a floor amendment to Senate Bill 57, a bill relating to expungement of felonies, in the Senate. 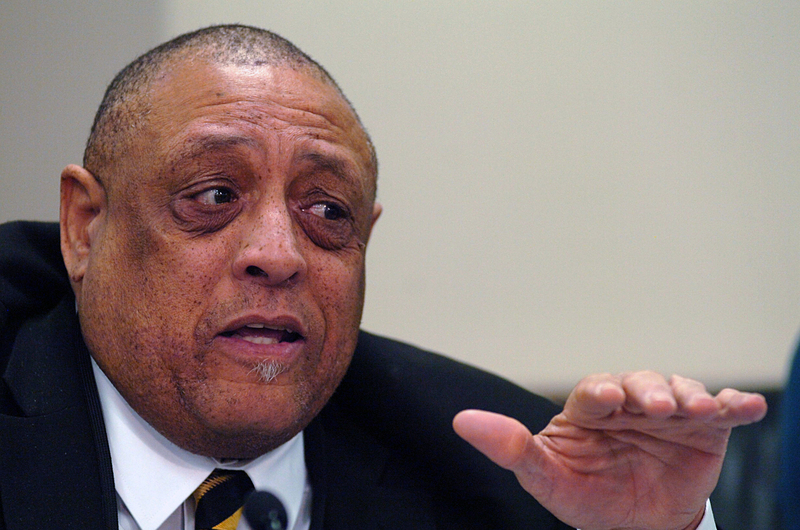 The amendment was adopted. 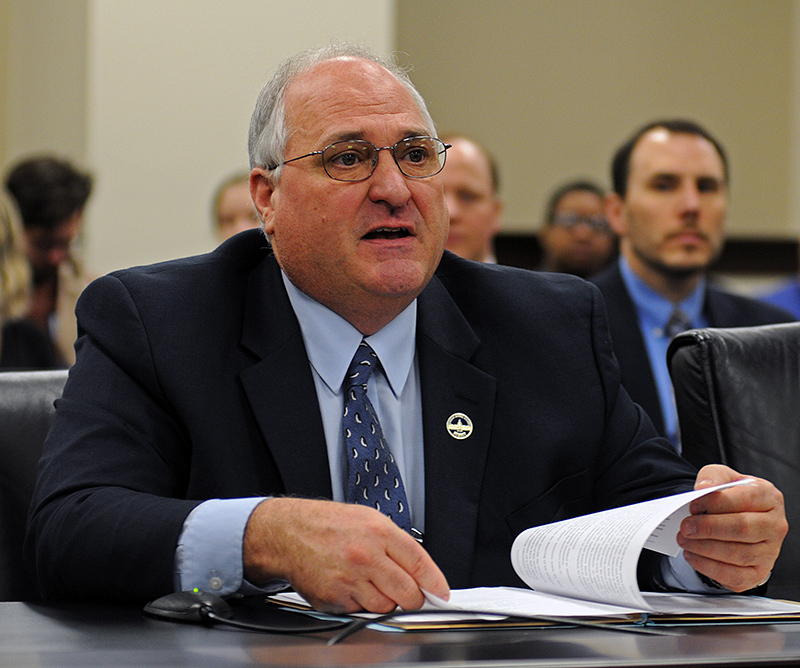 FRANKFORT, February 27 -- Rep. Kevin D. Bratcher, R-Louisville, presents House Bill 140, an act relating to the Kentucky Center for Education and Workforce Statistics, in the House. 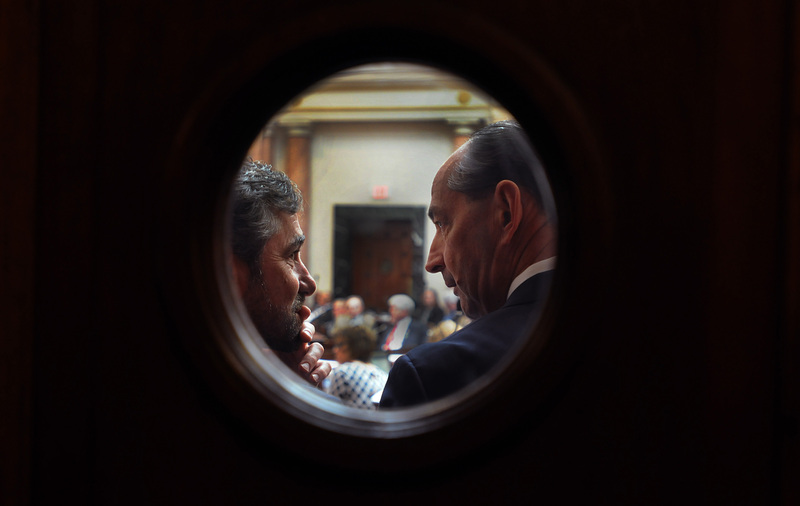 FRANKFORT, February 27 -- House Majority Whip Chad McCoy, R-Bardstown, speaks with Minority Floor Leader Rocky Adkins, D-Sandy Hook, in the House. 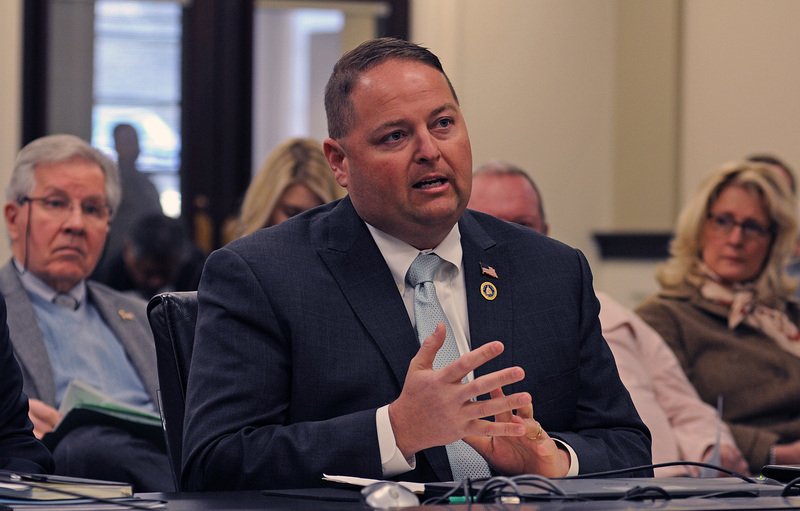 FRANKFORT, February 26 -- Rep. Jim Glenn, D-Owensboro, comments on House Bill 72, a bill relating to tuition benefits, in the House Education Committee. 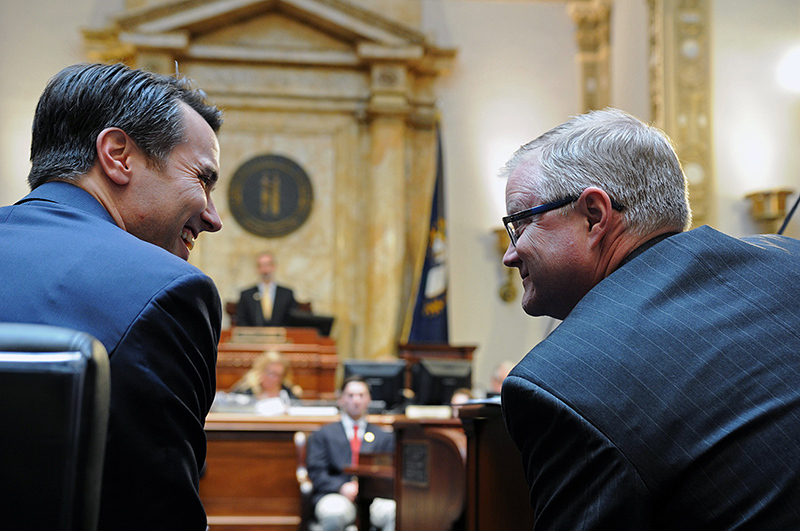 FRANKFORT, February 26 -- Senate Minority Floor Leader Morgan McGarvey, D-Louisville, (left) converses with Senate Majority Floor Leader Damon Thayer, R-Georgetown, in the Senate. 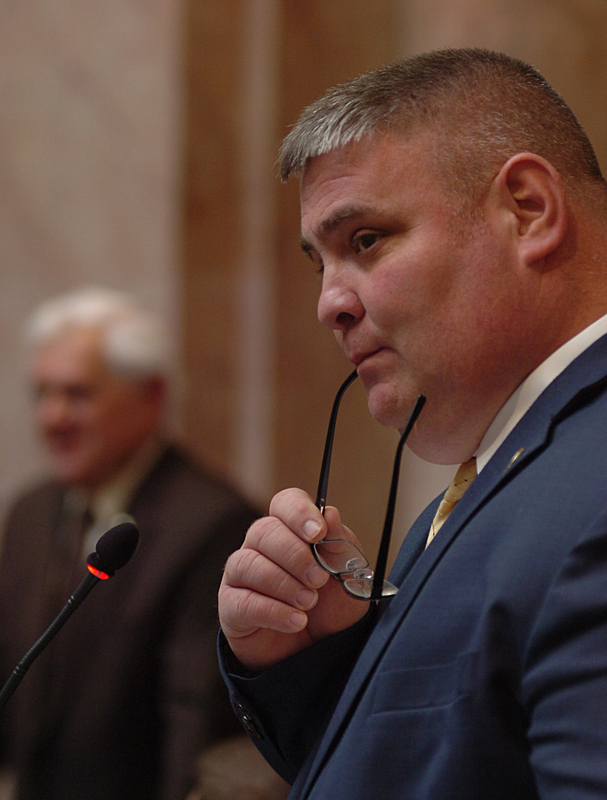 FRANKFORT, February 26 -- Rep. Chris Fugate, R-Chavies, listens to a question concerning House Bill 2, a bill he was presenting concerning relative and fictive kin caregivers, in the House. 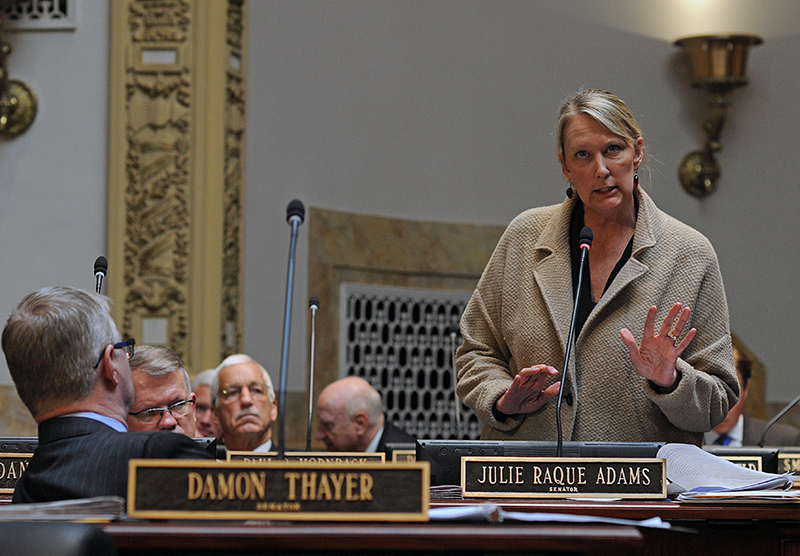 FRANKFORT, February 26 -- Senate Majority Caucus Chair Julie Raque Adams, R-Louisville, presents Senate Bill 250, a bill relating to public education, in the Senate. 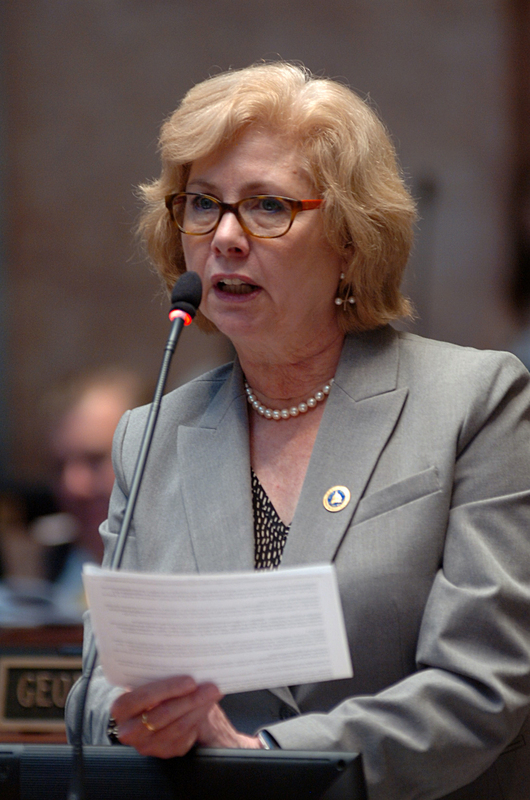 FRANKFORT, February 26 -- Rep. Melinda Gibbons Prunty, R-Belton, presents House Bill 5, a bill relating to the human rights of unborn children, in the House. 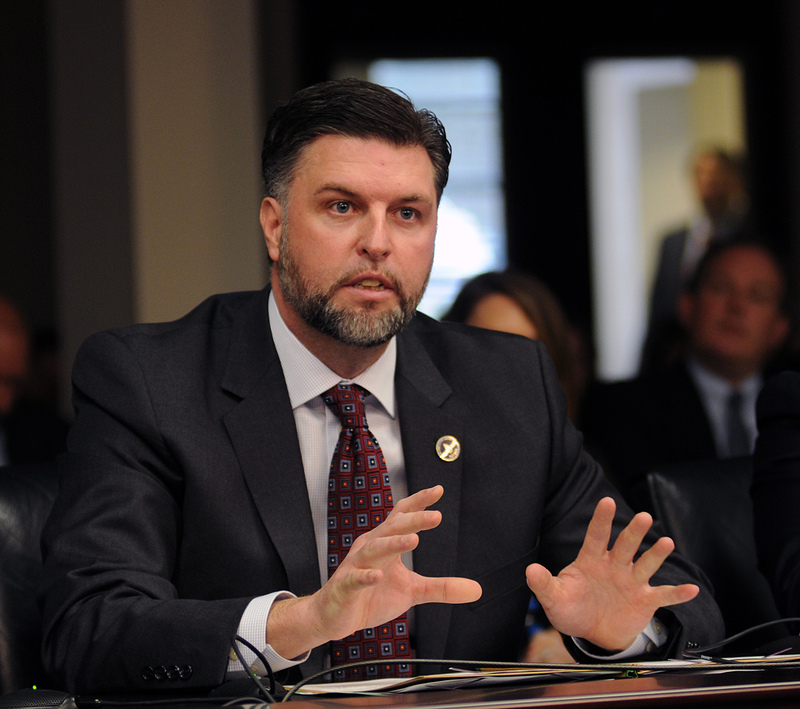 FRANKFORT, February 26 -- Senate Minority Whip Dennis Parrett, D-Elizabethtown, presents Senate Bill 184, a bill relating to veteran-owned nonprofit businesses, in the Senate Appropriations and Revenue Committee. 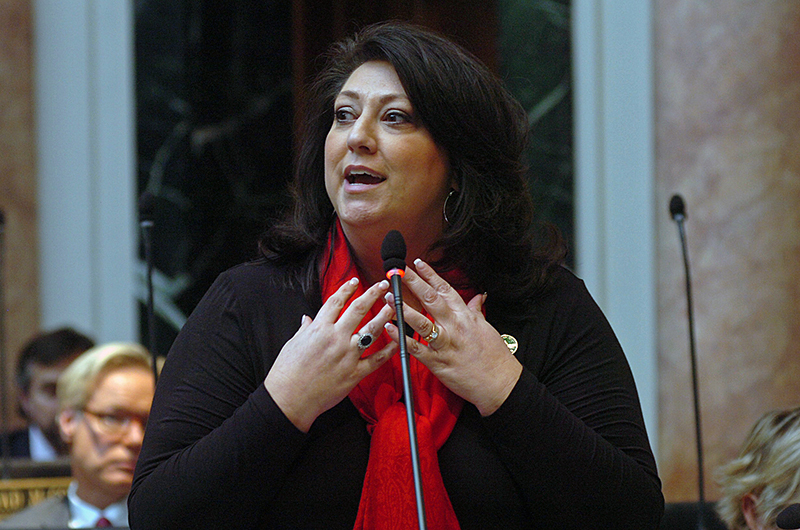 FRANKFORT, February 26 -- Rep. Josie Raymond, D-Louisville, comments on House Bill 5, a bill relating to the human rights of unborn children, in the House. 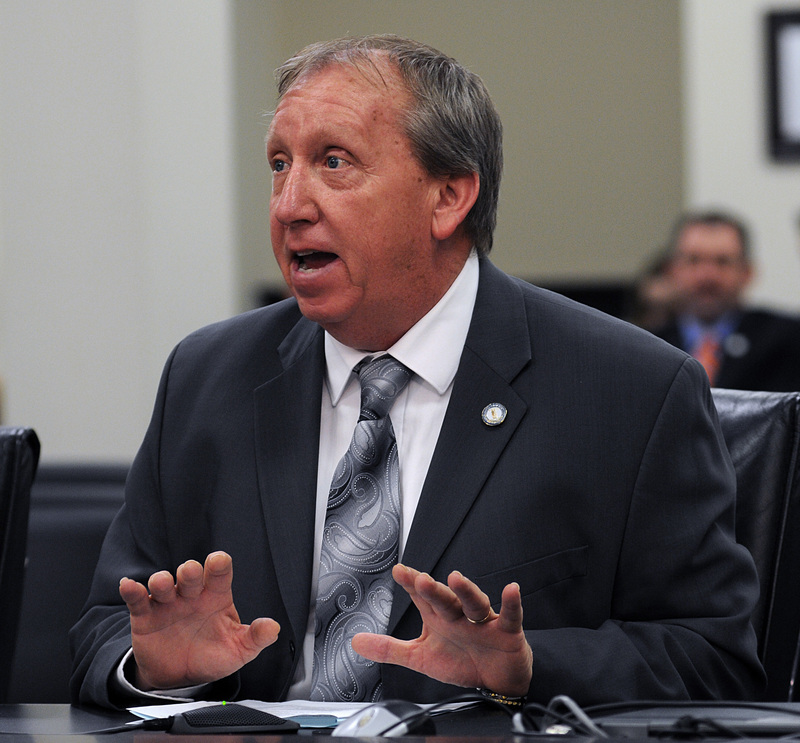 FRANKFORT, February 26 -- Rep. James Tipton, R-Taylorsville, presents House Bill 118, a bill relating to occupational licensure, in the Senate Licensing, Occupations, & Administrative Regulations Committee. 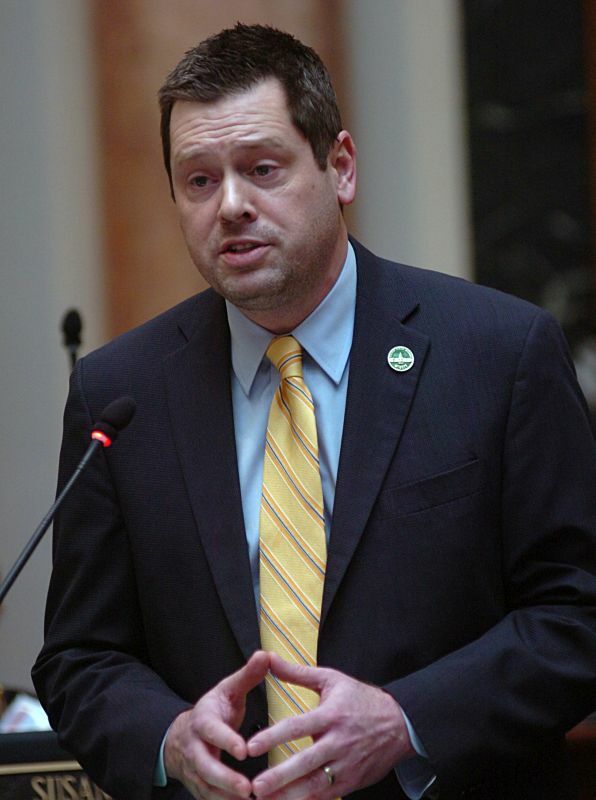 FRANKFORT, February 26 -- Rep. 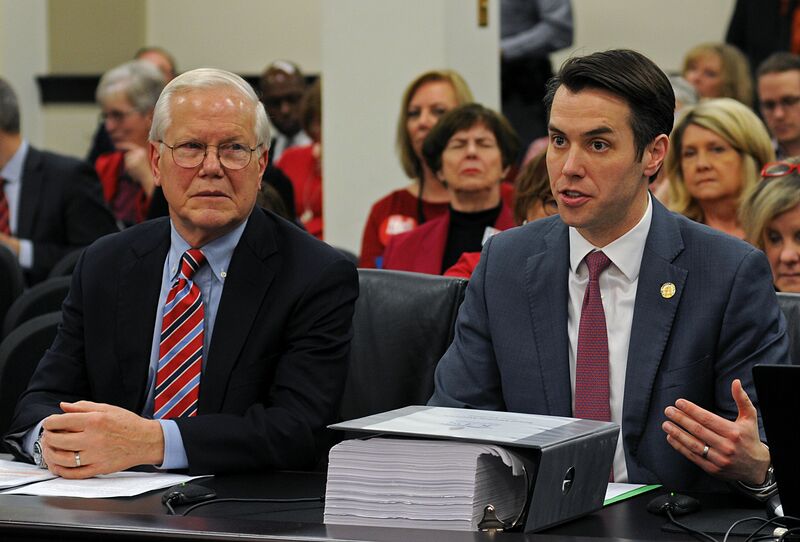 Rob Rothenburger, R-Shelbyville, presents House Bill 72, a bill relating to tuition benefits, in the House Education Committee. 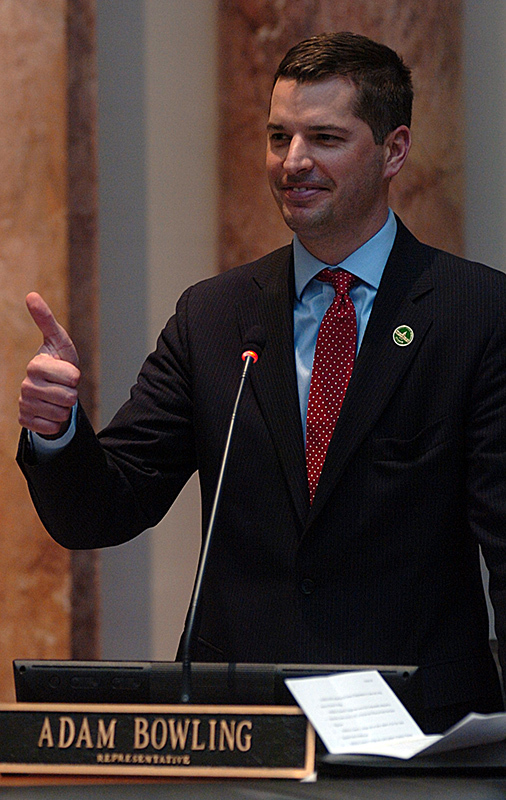 FRANKFORT, February 25 -- Rep. Adam Bowling, R- Middlesboro, gives a thumbs up upon the passage of his first bill, House Bill 396, a bill relating to the expansion of health insurance options within Kentucky, in the House. 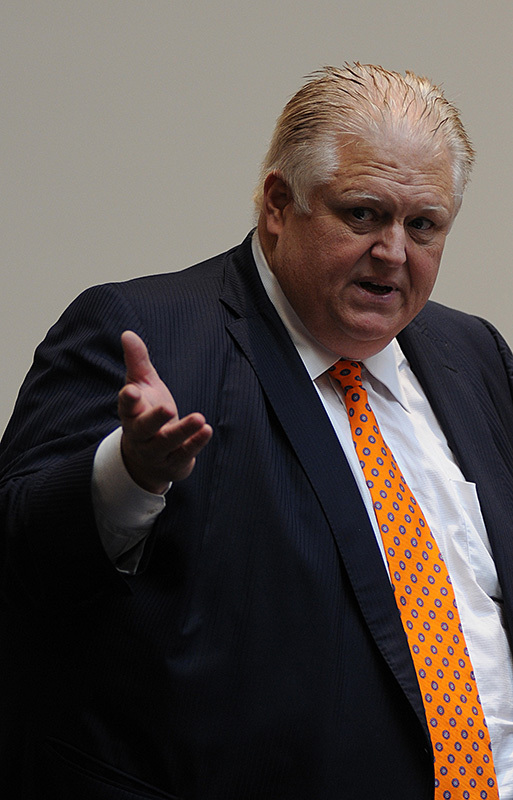 FRANKFORT, February 25 -- Sen. Stan Humphries, R-Cadiz, comments on Senate Bill 249, a bill relating to the sale of tobacco products, in the Senate Agriculture Committee. 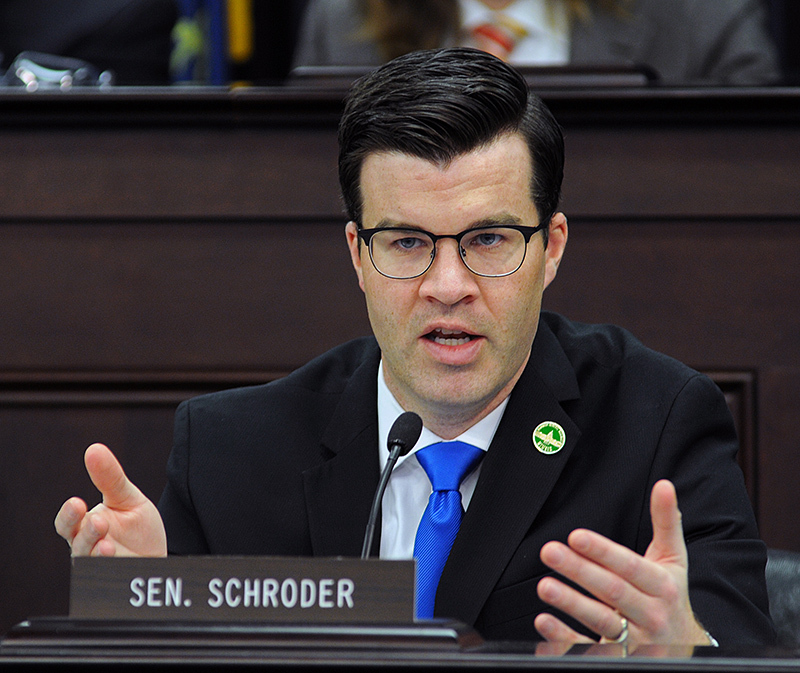 FRANKFORT, February 25 -- Sen. Wil Schroder, R-Wilder, comments on Senate Bill 2, a bill relating to civil actions, in the Senate Judiciary Committee. 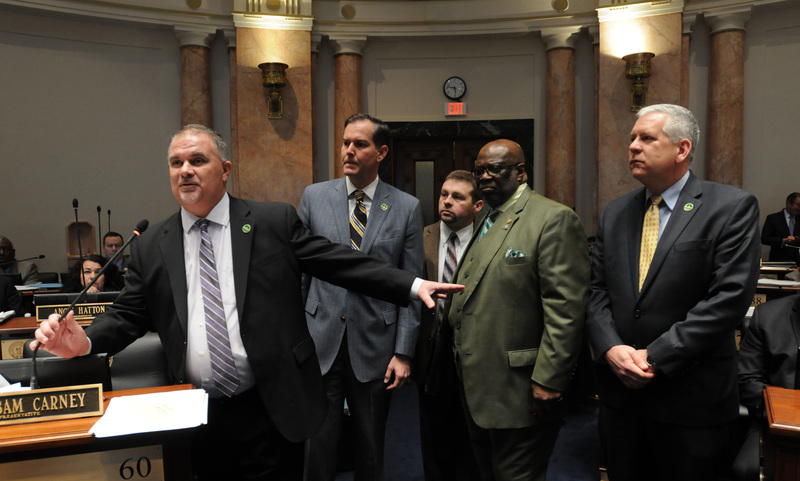 FRANKFORT, February 25 -- (left to right) Rep. Phillip Pratt, R-Georgetown, Rep. Chris Freeland, R-Benton, and Rep. Randy Bridges, R-Paducah, talk following adjournment of the House. 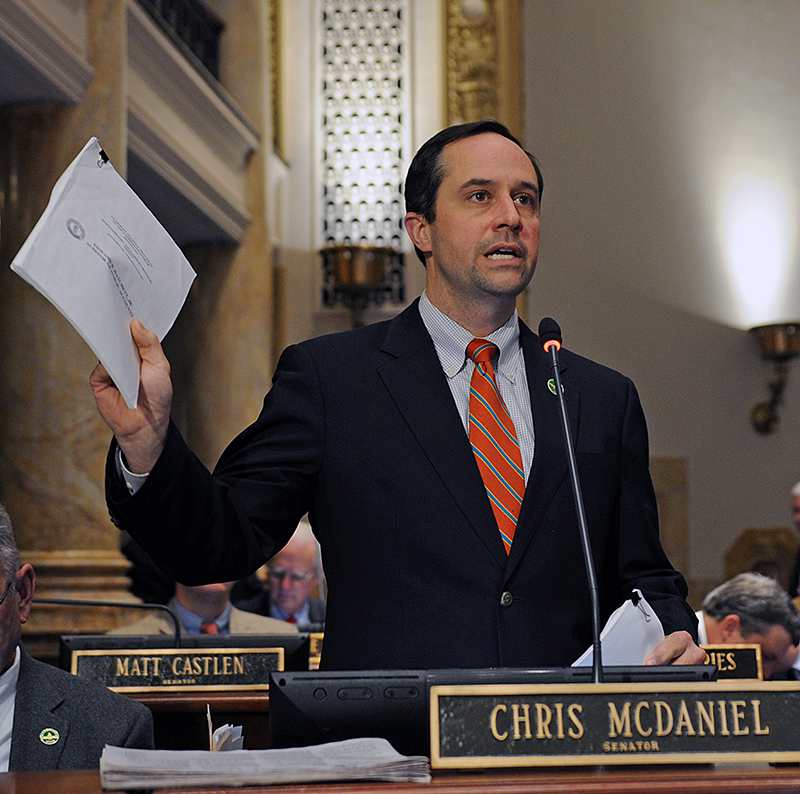 FRANKFORT, February 25 -- Sen. Christian McDaniel, R-Taylor Mill, presents Senate Bill 205, a bill relating to guardians ad litem, in the Senate. 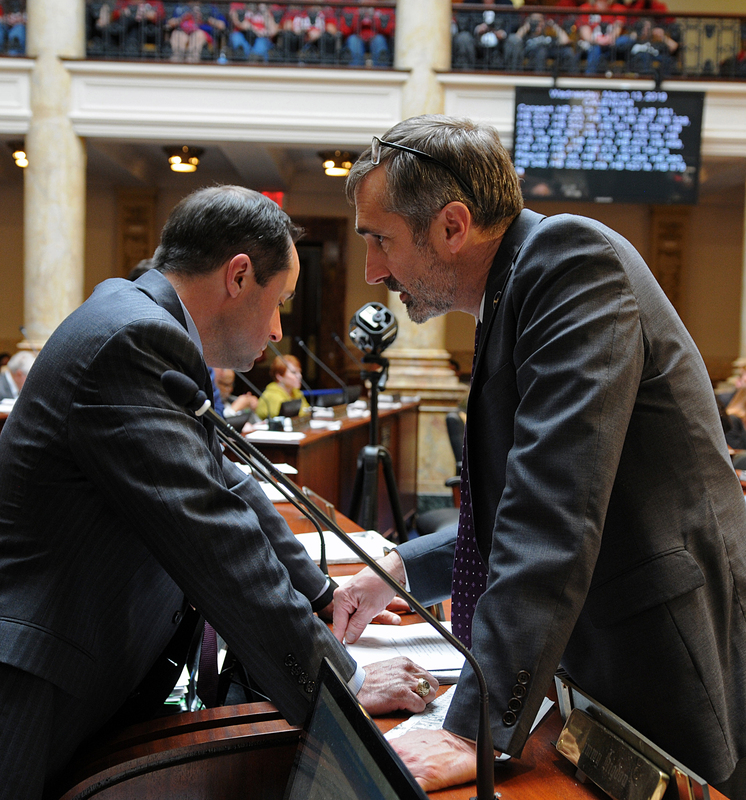 FRANKFORT, February 25 -- Rep. Steve Riley, R-Glasgow, (left) speaks with Rep. David Hale, R-Wellington, following adjournment of the House. 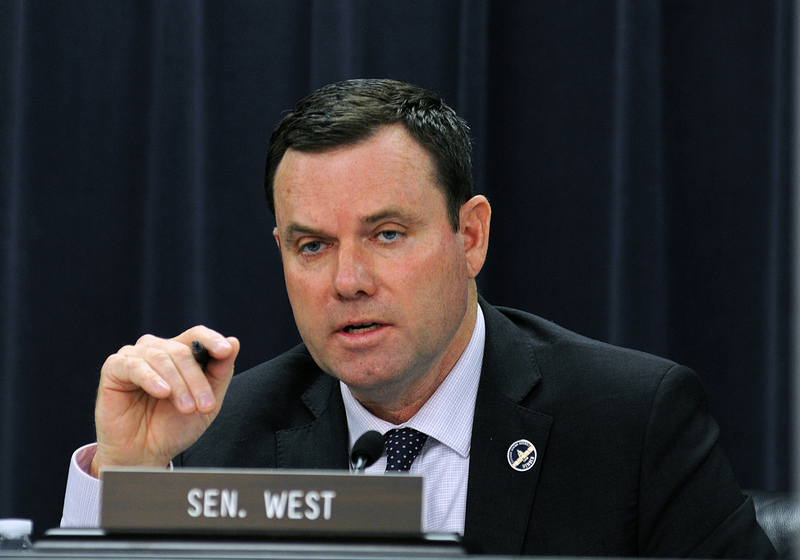 FRANKFORT, February 25 -- Sen. Stephen West, R-Paris, comments on Senate Bill 157, a bill relating to drones, in the Senate Judiciary Committee. 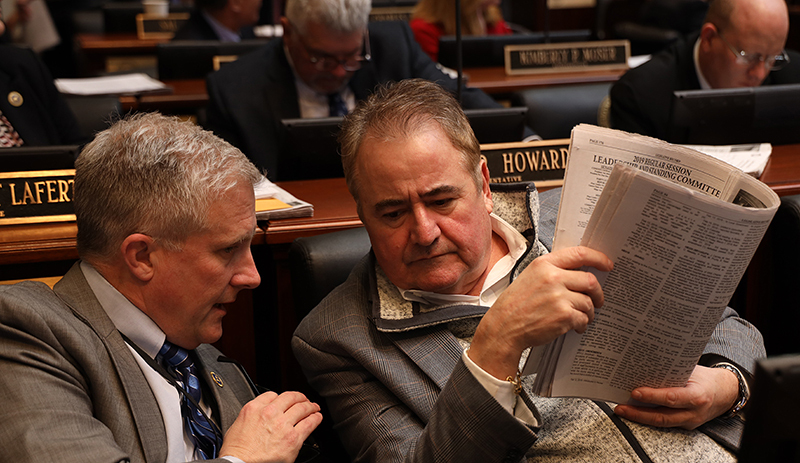 FRANKFORT, February 25 -- Rep. Sal Santoro, R-Florence, (left) works with Sen. Ernie Harris, R-Prospect, on some legislation in the House. 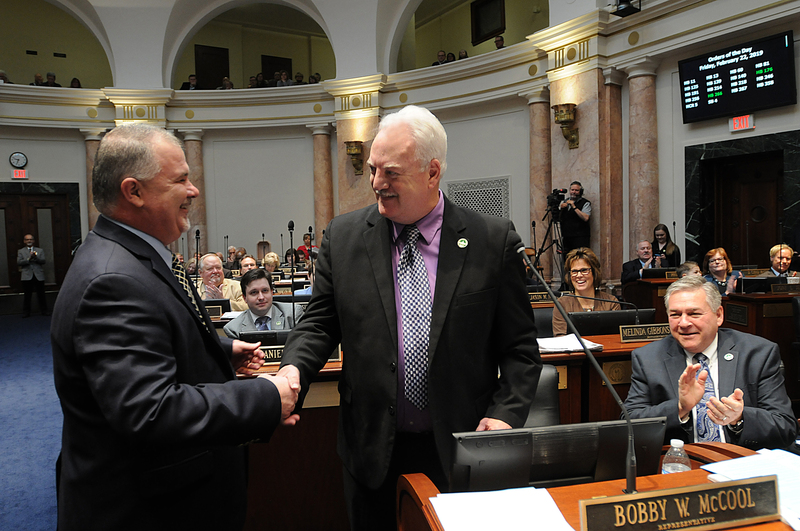 FRANKFORT, February 22 -- Majority Floor Leader John Bam Carney, R-Campbellsville, (left) congratulates Rep. Bobby McCool, R-Van Lear, upon the passage of McCool’s first bill in the House. 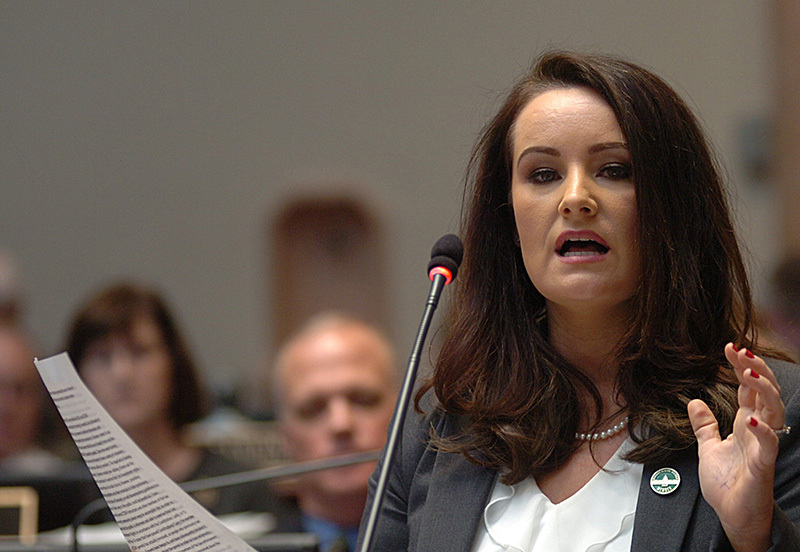 The bill is House Bill 266 relating to speed limits. 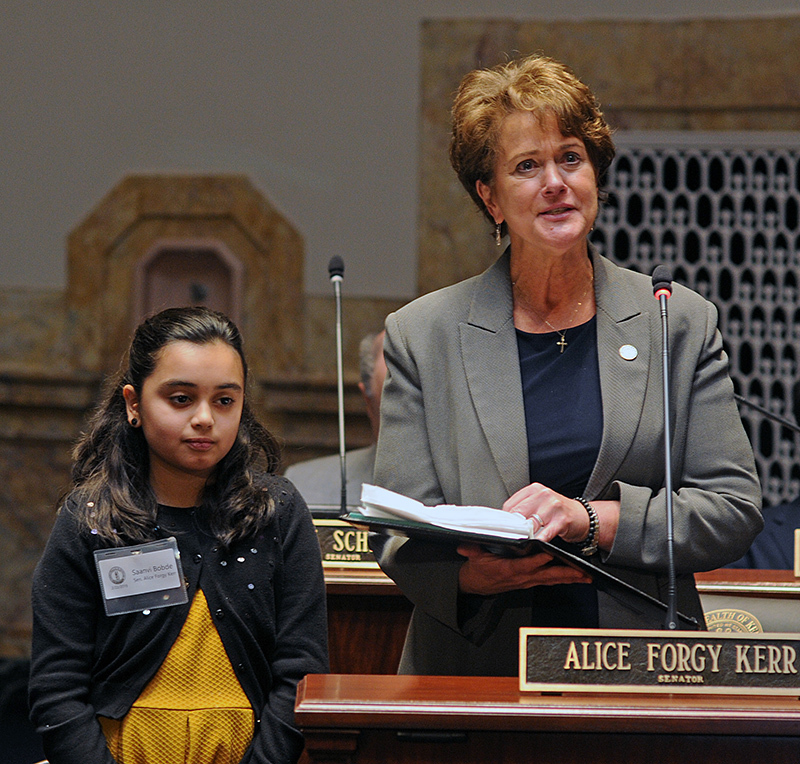 FRANKFORT, February 22 -- Sen. Alice Forgy Kerr, R-Lexington, asks that her page, Rosa Parks Elementary fifth-grader Saanvi Bobde, stand at her side as she explains Senate Bill 18, a measure addressing pregnancy-related discrimination. 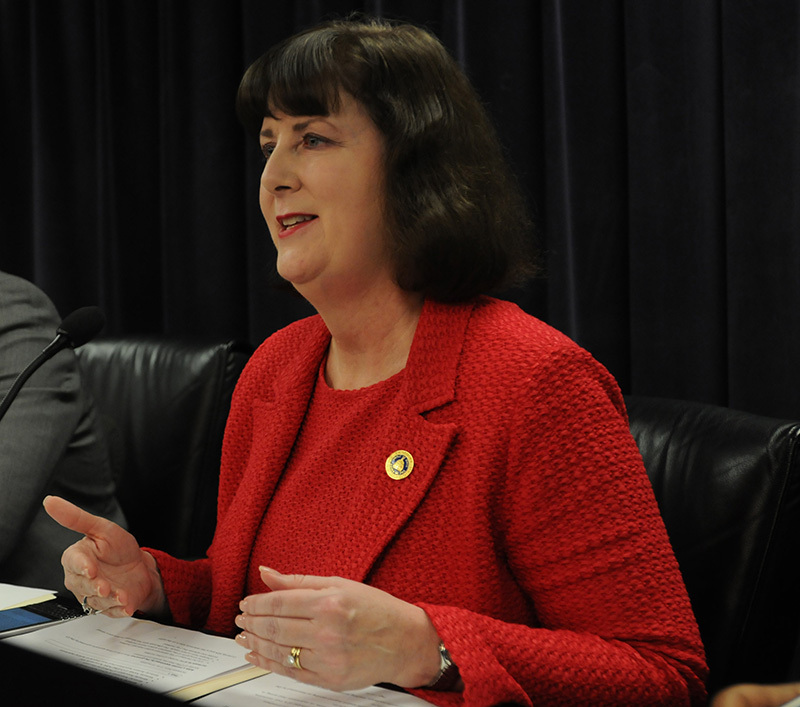 Kerr says she sponsored SB 18, in part, to help future women of Kentucky, like Saanvi. 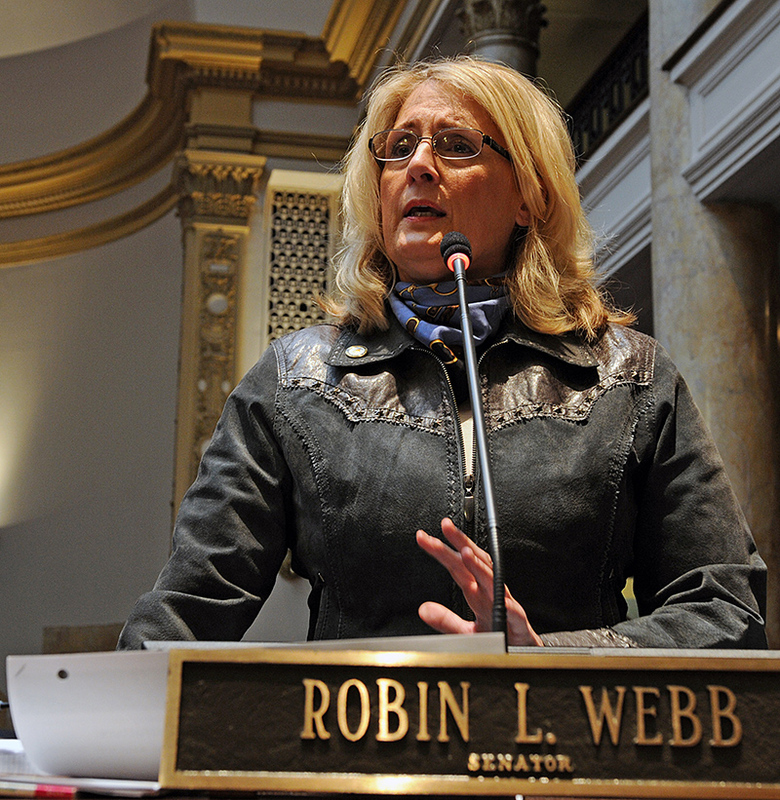 FRANKFORT, February 22 -- Sen. Robin L. Webb, D-Grayson, presents Senate Concurrent Resolution 81, a resolution establishing the Small Community Public Drinking Water System Failure Prevention Task Force, in the Senate. 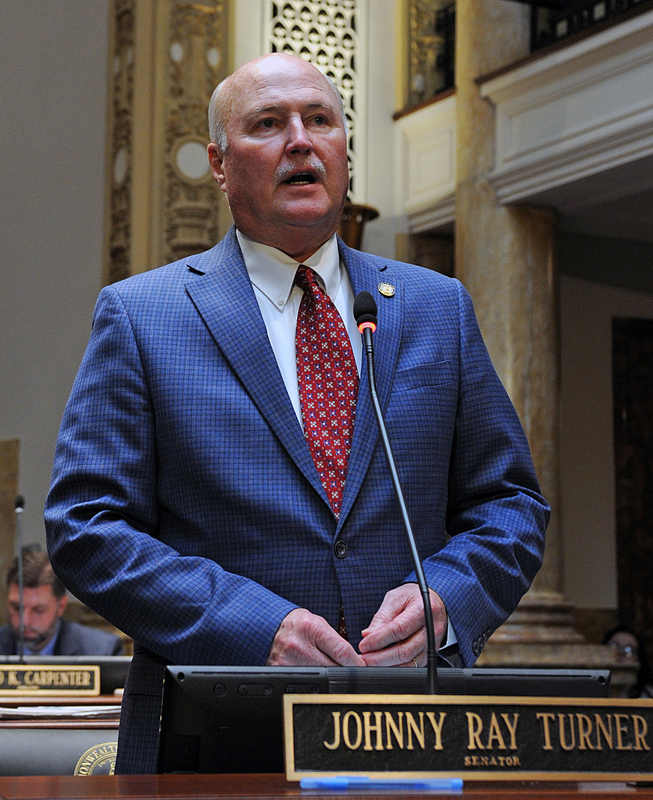 FRANKFORT, February 22 -- Senate Minority Caucus Chair Johnny Ray Turner, D-Prestonsburg, addresses the Senate. 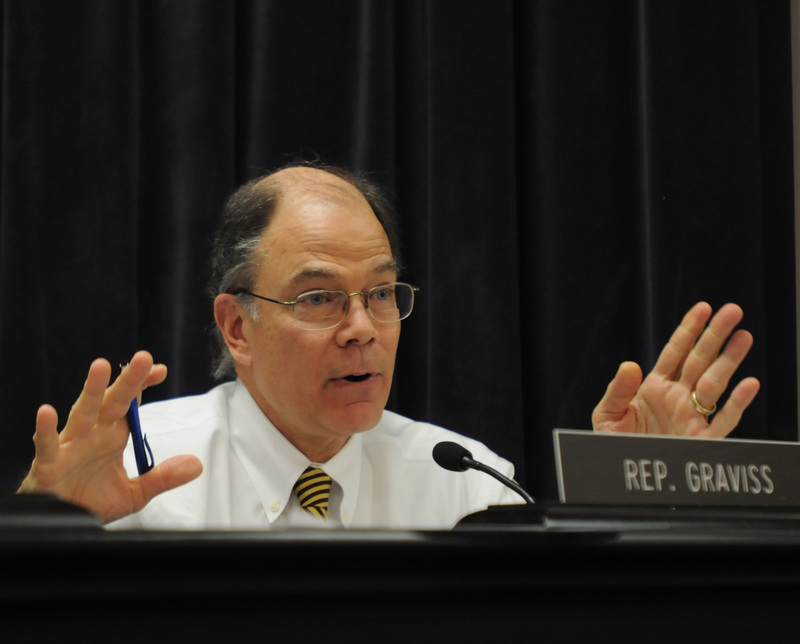 FRANKFORT, February 21 -- Senate President Pro Tem David P. Givens, R-Greensburg, presents Senate Bill 175, a bill relating to public school assessments and accountability, in the Senate Education Committee. 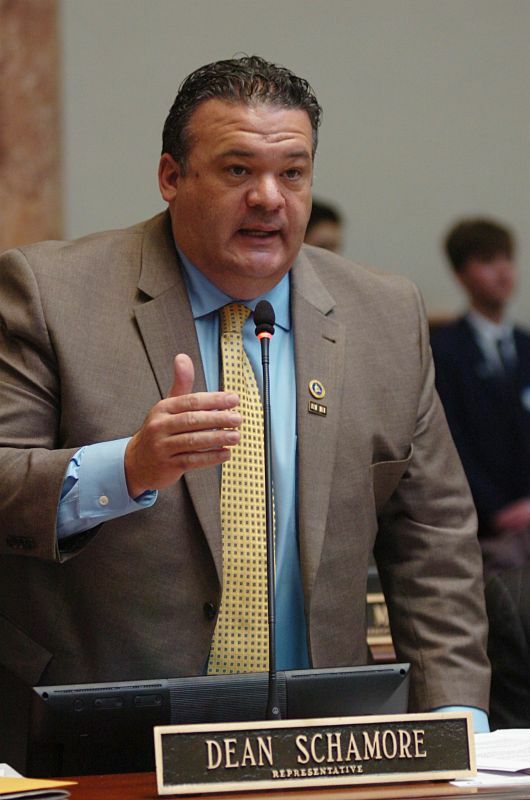 FRANKFORT, February 21 -- Rep. Steven Rudy, R-Paducah, presents House Bill 268, a bill relating to submission of budget unit requests, in the House. 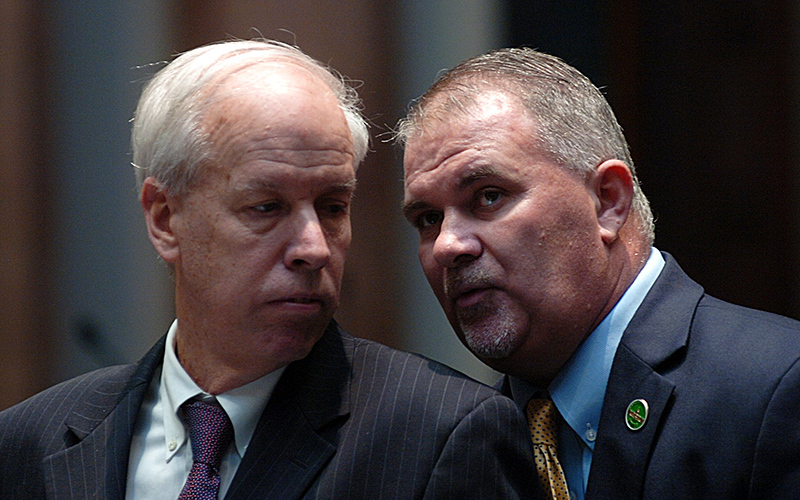 FRANKFORT, February 21 – John T. McGarvey, Kentucky Commissioner to the Uniform Law Commission, (left) sits with his son, Senate Minority Floor Leader Morgan McGarvey, D-Louisville, as Sen. McGarvey presents Senate Bill 208, a bill relating to athlete agents, in the Senate Education Committee. 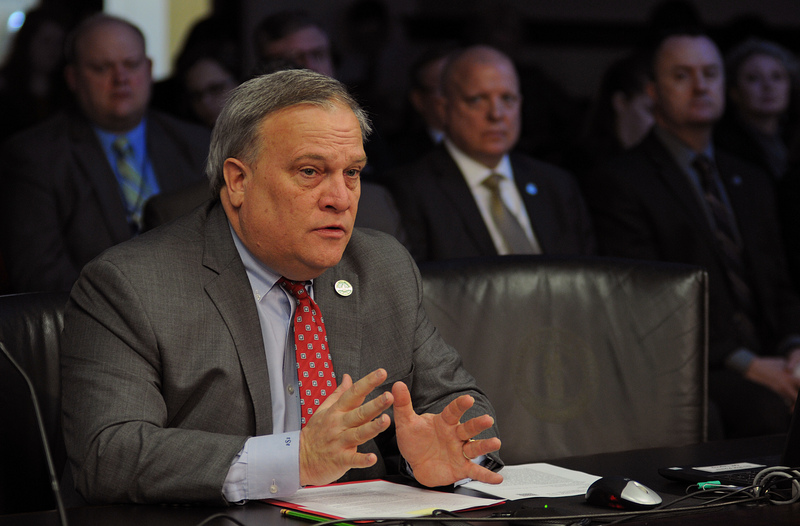 FRANKFORT, February 21 -- Senate President Robert Stivers II, R-Manchester, presents Senate Bill 214, a bill relating to legislative redistricting challenges, in the Senate Judiciary Committee. FRANKFORT, February 21 -- Rep. Dean Schamore, D-Hardinsburg, speaks on House Bill 268, a bill relating to submission of budget unit requests, in the House. 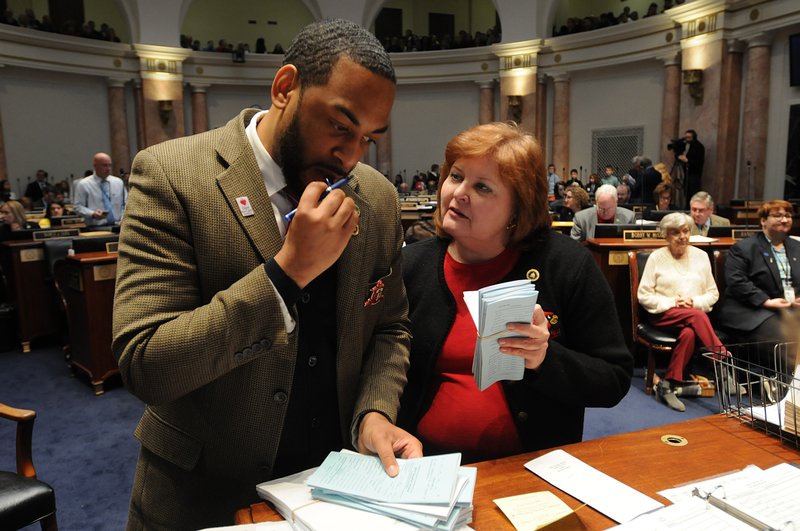 FRANKFORT, February 20 -- Rep. Charles Booker, D-Louisville, (left) and House Minority Whip Joni Jenkins, D-Shively, file bills in the House. 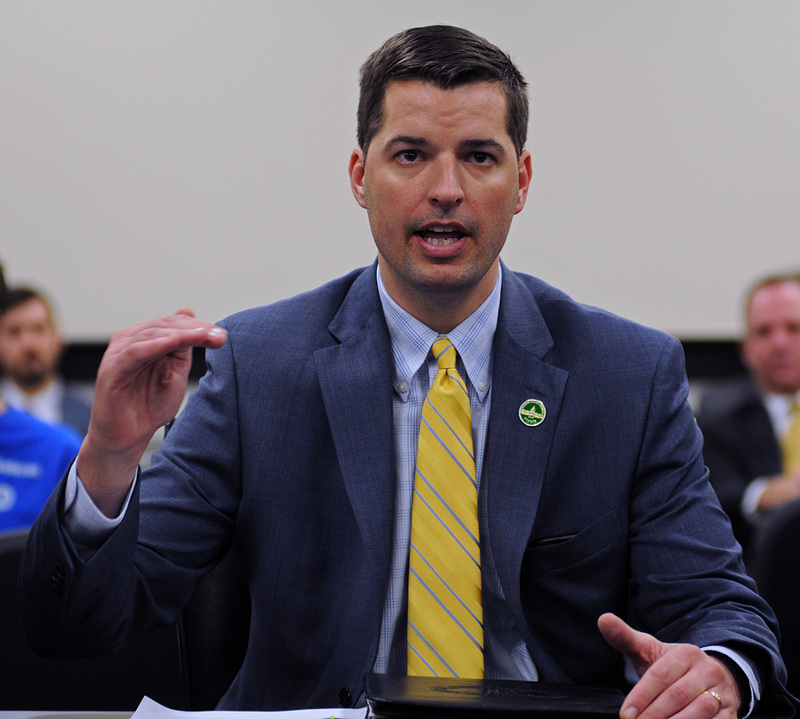 FRANKFORT, February 20 -- Sen. Jared Carpenter, R-Berea, presents Senate Bill 163, a bill relating to the acquisition of water or sewer utilities, in the Senate Natural Resources & Energy Committee. 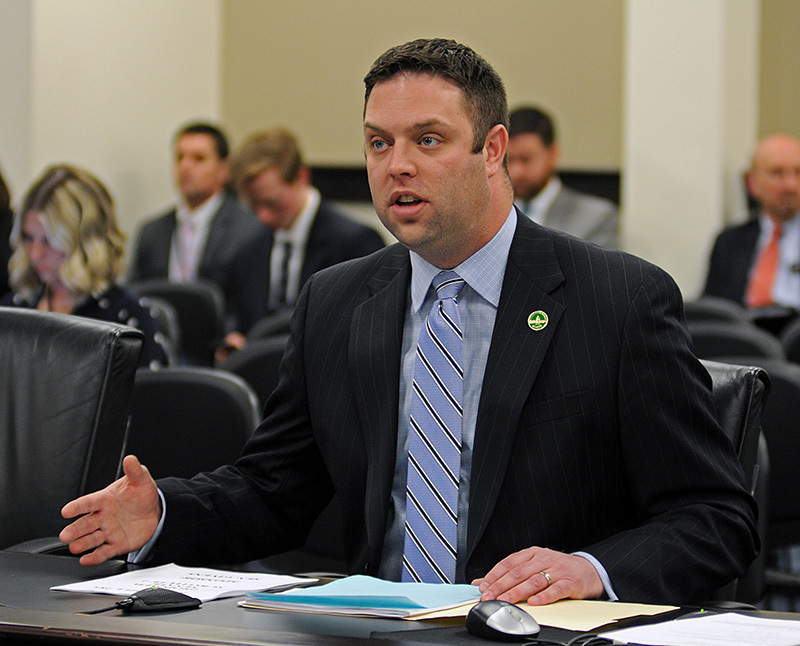 FRANKFORT, February 20 -- Rep. Adam Koenig, R-Erlanger, presents House Bill 175, a bill relating to wagering, in the House Licensing, Occupations, & Administrative Regulations Committee. 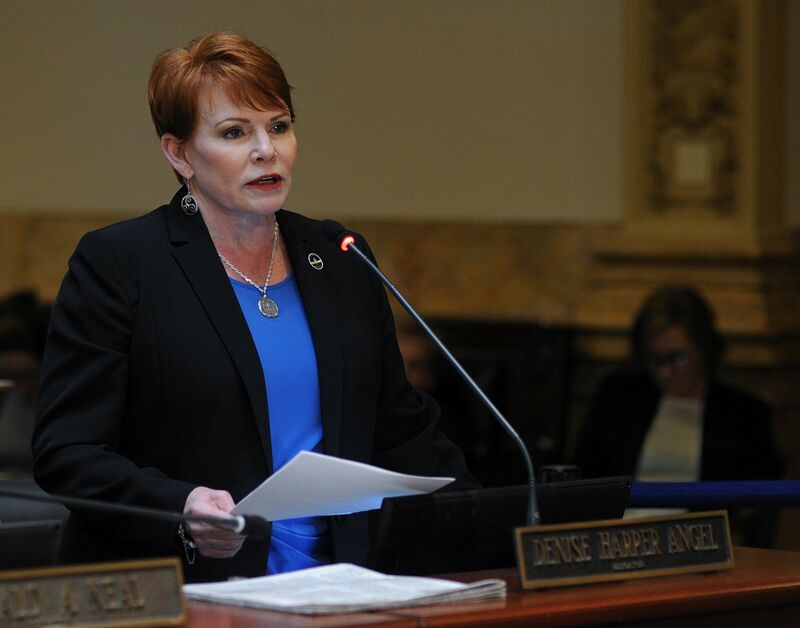 FRANKFORT, February 20 -- Sen. Denise Harper Angel, D-Louisville, presents Senate Bill 97, a bill relating to sexual assault forensic evidence kits, in the Senate. 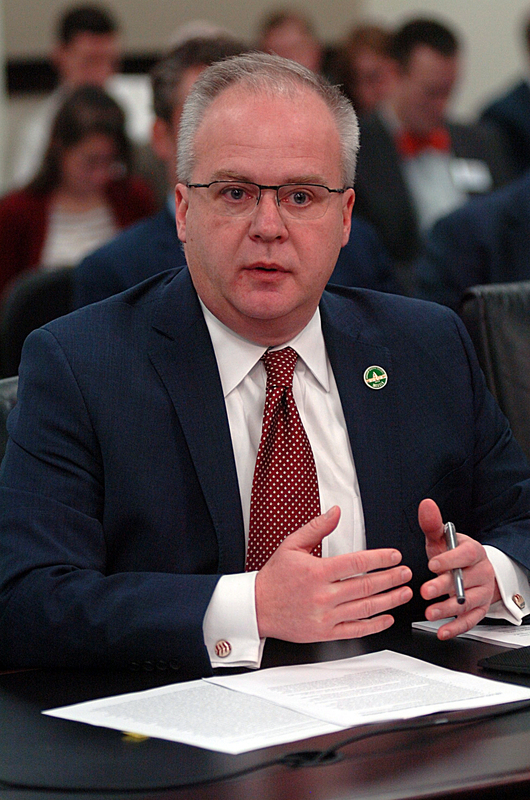 FRANKFORT, February 20 -- Sen. Max Wise, R-Campbellsville, speaks about a report released yesterday titled “Medicaid Pharmacy Pricing: Opening the Black Box” dealing with Medicaid and pharmacy costs, in the Senate. 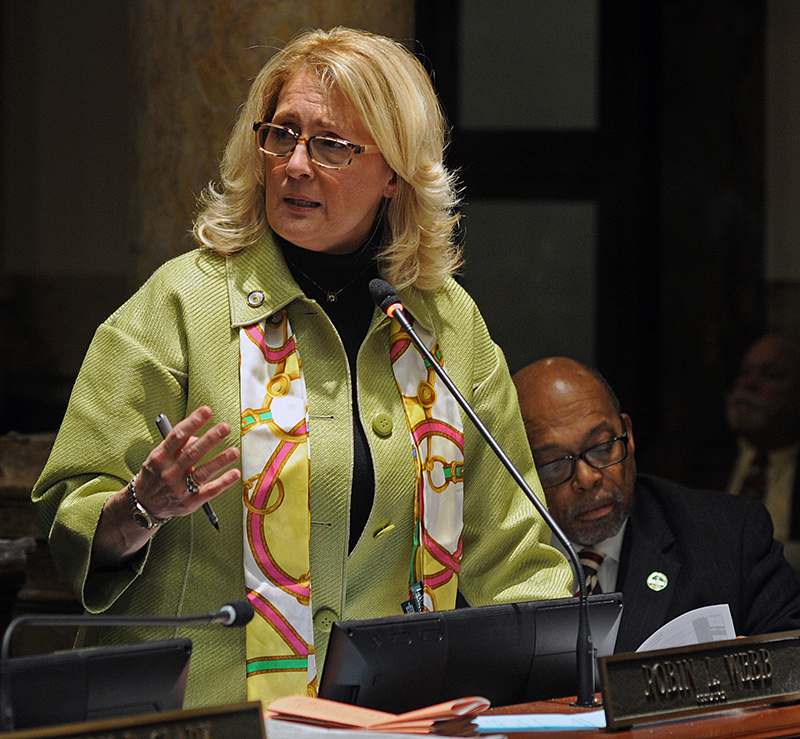 FRANKFORT, February 20 -- Rep. Lisa Willner, D-Louisville, speaks on House Bill 166, an act relating to a day of prayer for students, in the House. 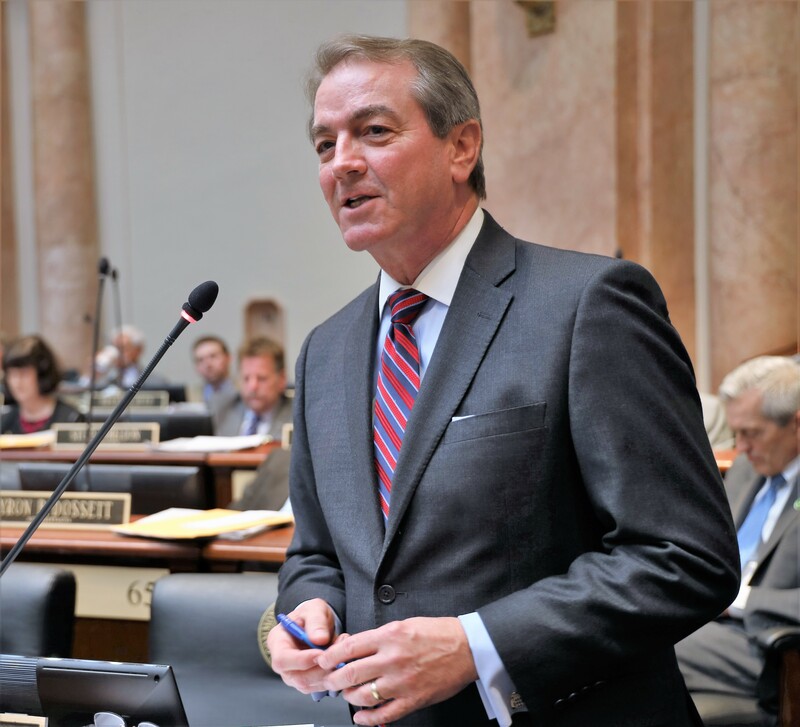 FRANKFORT, February 20 -- Sen. Tom Buford, R-Nicholasville, presents Senate Bill 96, a bill relating to expedited partner therapy for a sexually transmitted disease, in the Senate. 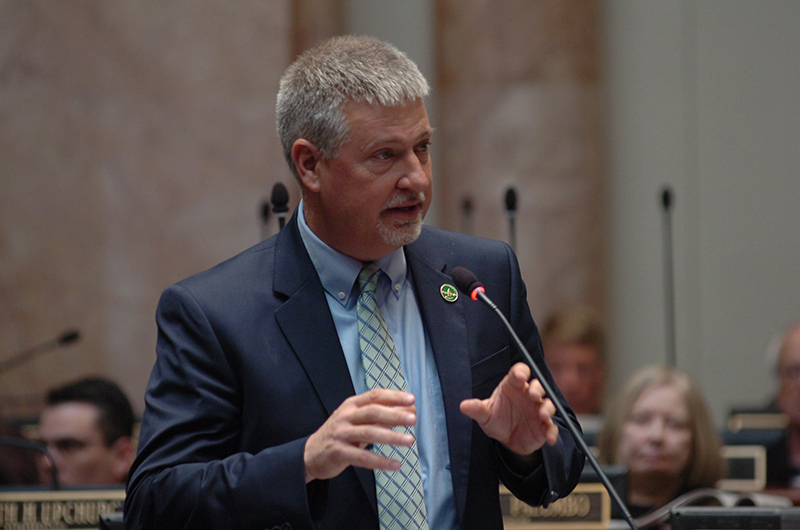 FRANKFORT, February 20 -- Rep. John Blanton, R-Salyersville, speaks on House Bill 166, an act relating to a day of prayer for students, in the House. 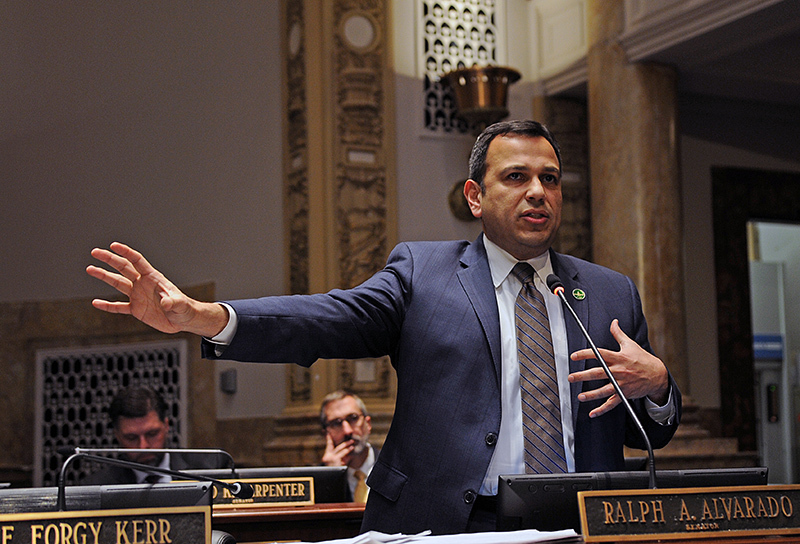 FRANKFORT, February 20 -- Sen. Ralph Alvarado, R-Winchester, speaks about a report released yesterday titled “Medicaid Pharmacy Pricing: Opening the Black Box” dealing with Medicaid and pharmacy costs, in the Senate. 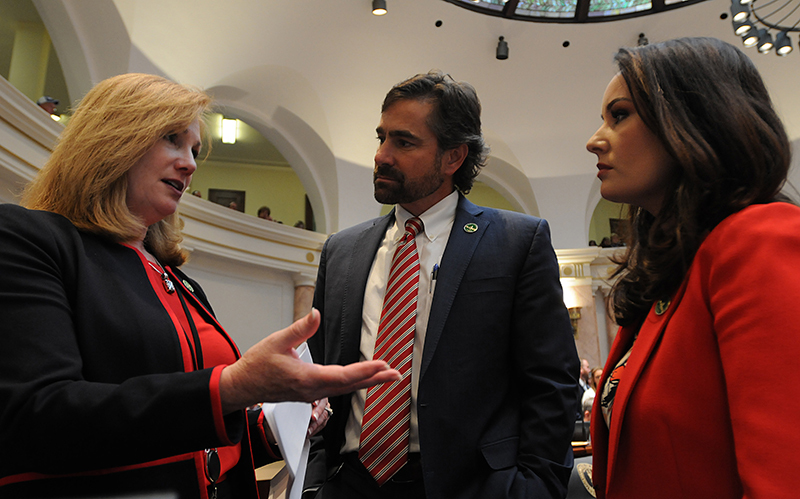 FRANKFORT, February 20 -- (left to right) Rep. Kimberly Poore Moser, R-Taylor Mill, House Majority Whip Chad McCoy, R-Bardstown, and Rep. Savannah Maddox, R-Dry Ridge, discuss legislation in the House. 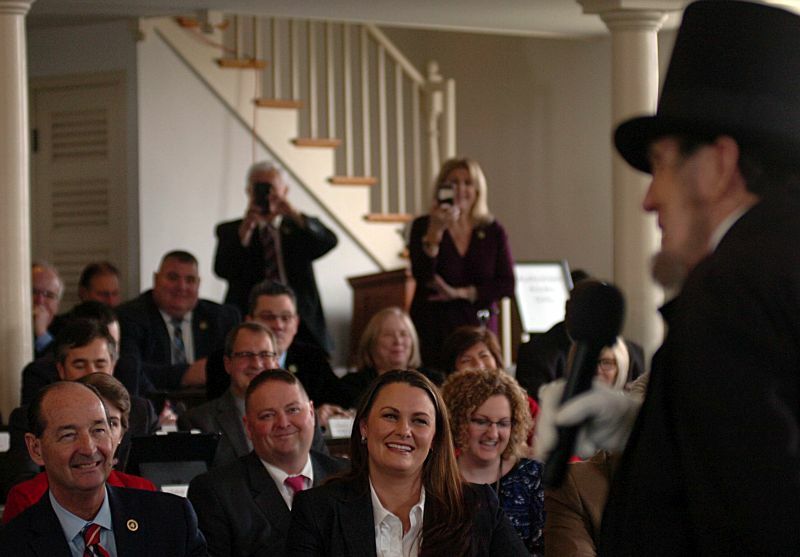 FRANKFORT, February 19 – (left to right) Minority Floor Leader Rocky Adkins, D-Sandy Hook, Rep. John Sims Jr, D-Flemingsburg, and Rep. Ashley Tackett Laferty, D-Martin, laugh as they listen to Abraham Lincoln impersonator Jim Sayre of Lawrenceburg in the Old State Capitol. 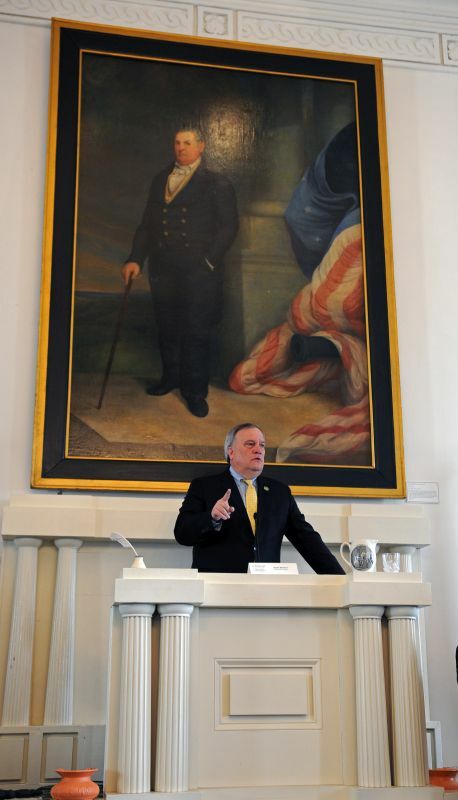 FRANKFORT, February 19 -- Senate President Robert Stivers II, R-Manchester, presides over the Senate as they meet in the Old State Capitol. 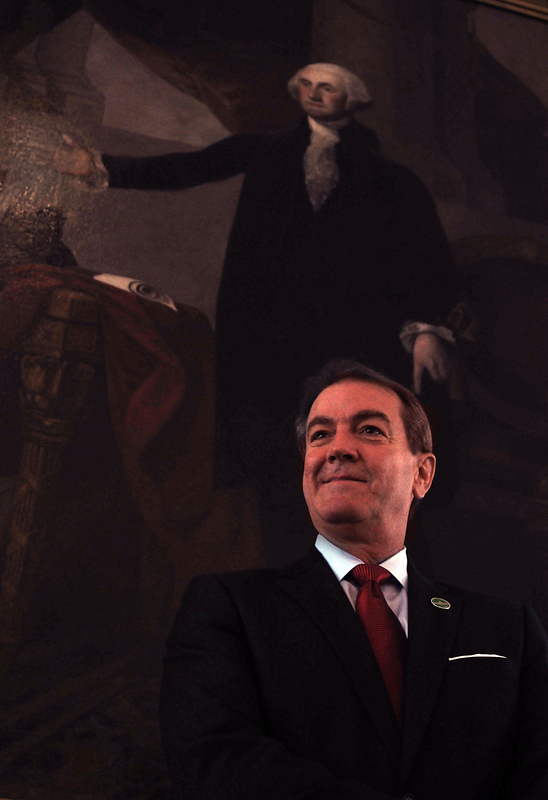 FRANKFORT, February 19 -- Speaker of the House David Osborne, R-Prospect, stands in front of a portrait of George Washington as he presides over the House in the Old State Capitol. 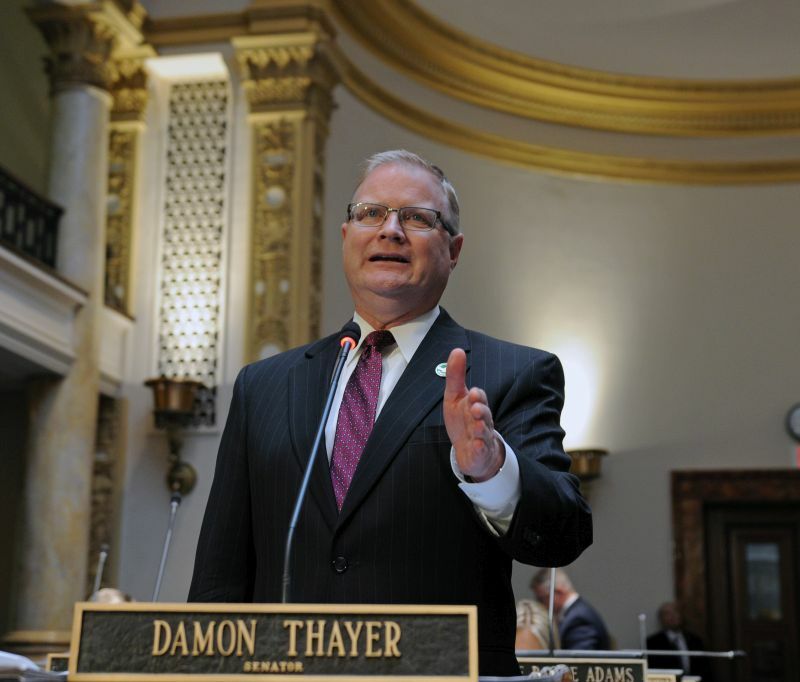 FRANKFORT, February 19 -- Senate Majority Floor Leader Damon Thayer, R-Georgetown, presents Senate Bill 34, a bill relating to elections, in the Senate. 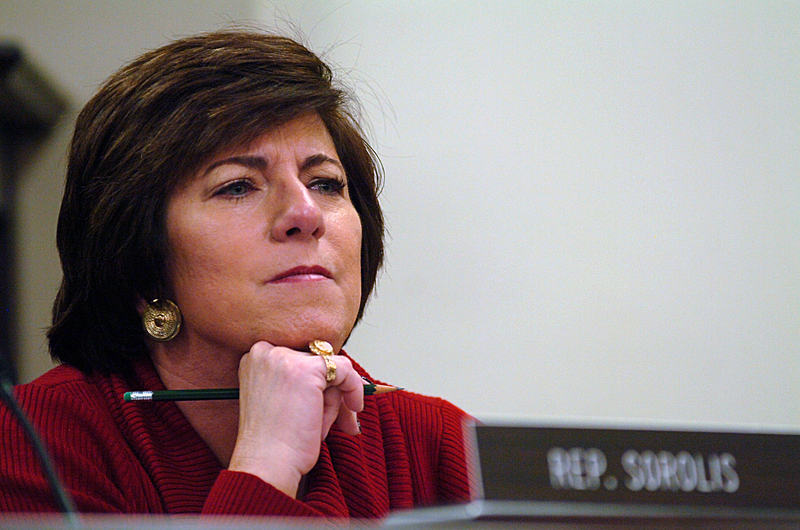 FRANKFORT, February 19 -- Rep. Maria Sorolis, D-Louisville, listens to a presentation on House Bill 341, an act relating to special license plates, in the House Transportation Committee. 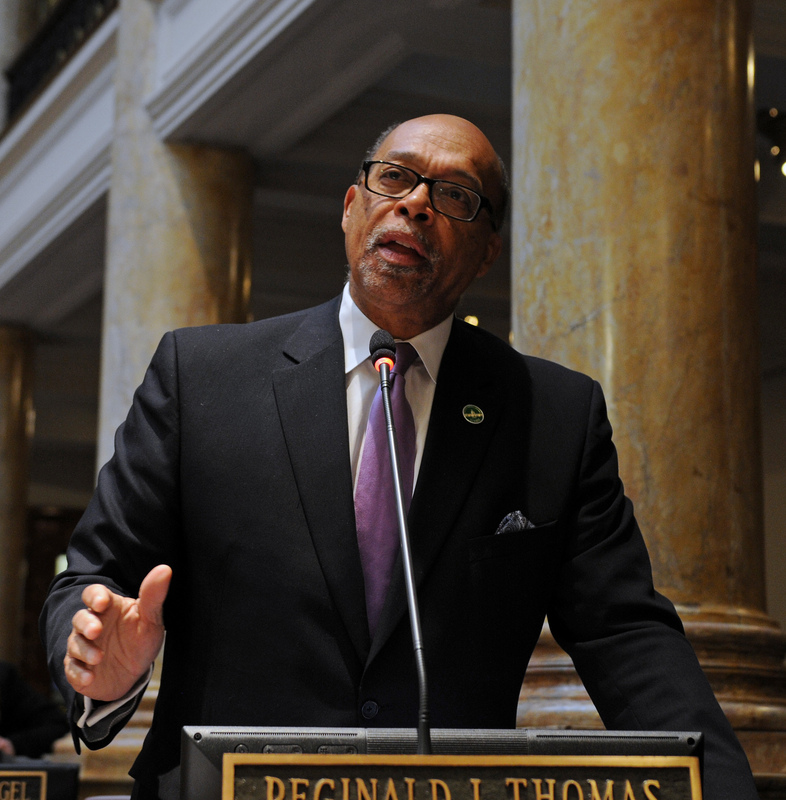 FRANKFORT, February 19 -- Sen. Reginald Thomas, D-Lexington, speaks on Senate Bill 34, a bill relating to elections, in the Senate. 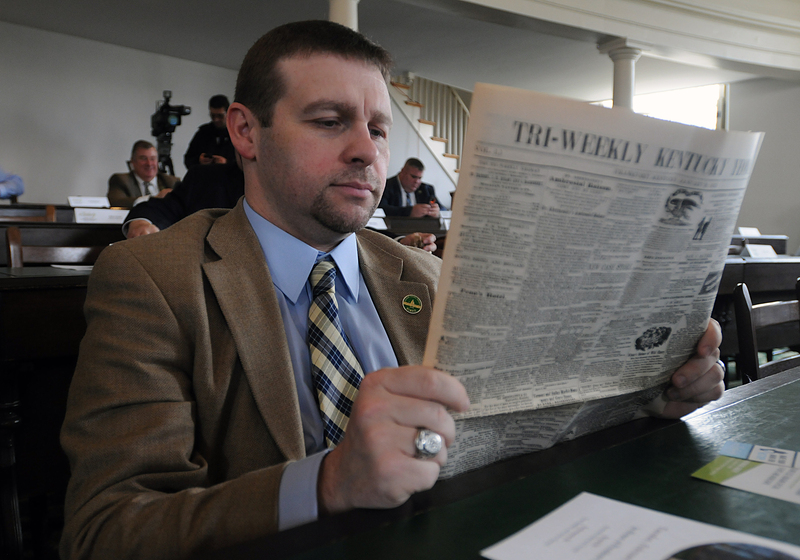 FRANKFORT, February 19 -- Rep. Brandon Reed, R-Hodgenville, looks over an old newspaper he found in a desk in the House chamber of the Old State Capitol. 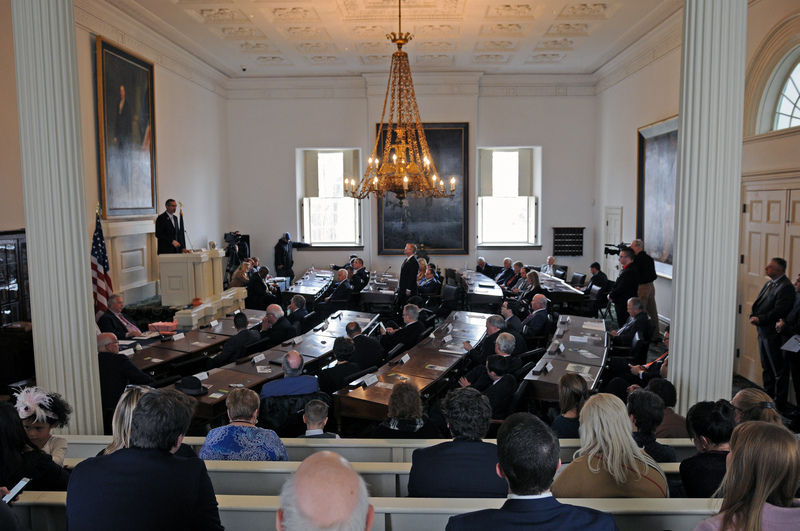 FRANKFORT, February 19 – The Senate meets in the Senate chamber of the Old State Capitol. 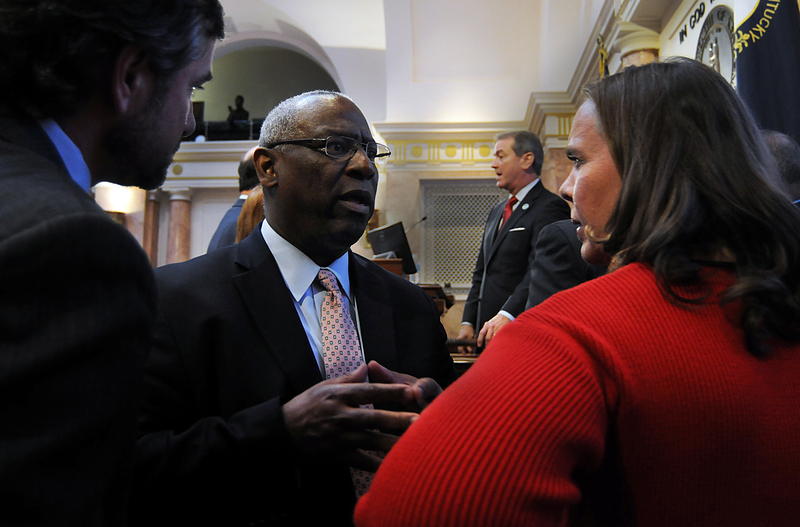 FRANKFORT, February 19 -- (left to right) House Majority Whip Chad McCoy, R-Bardstown, Minority Caucus Chair Derrick Graham, D-Frankfort, and House Majority Caucus Chair Suzanne Miles, R-Owensboro, talk during the meeting of the Committee on Committees in the House. 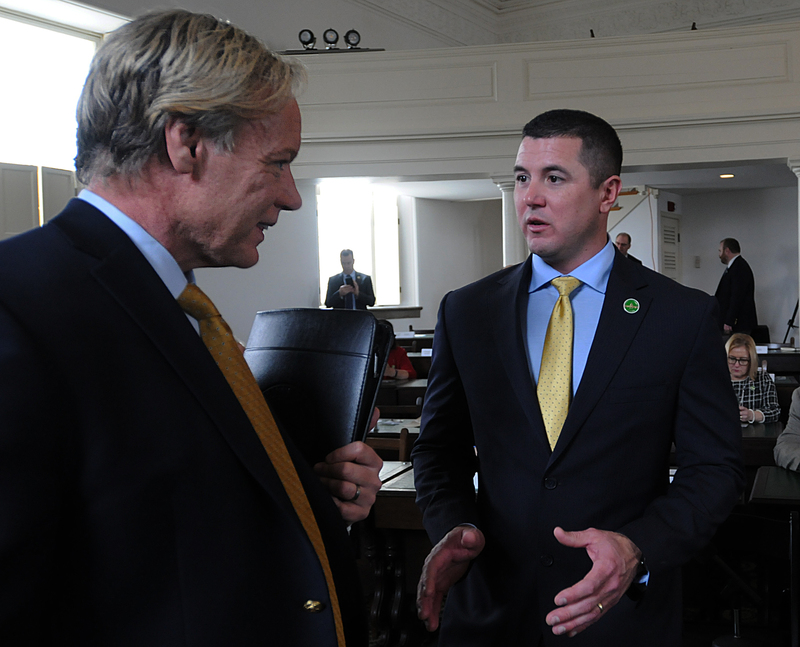 FRANKFORT, February 19 -- Rep. Chris Freeland, R-Benton, (left) speaks with House Speaker Pro Tem David Meade, R-Stanford, before the House convenes at the Old State Capitol. 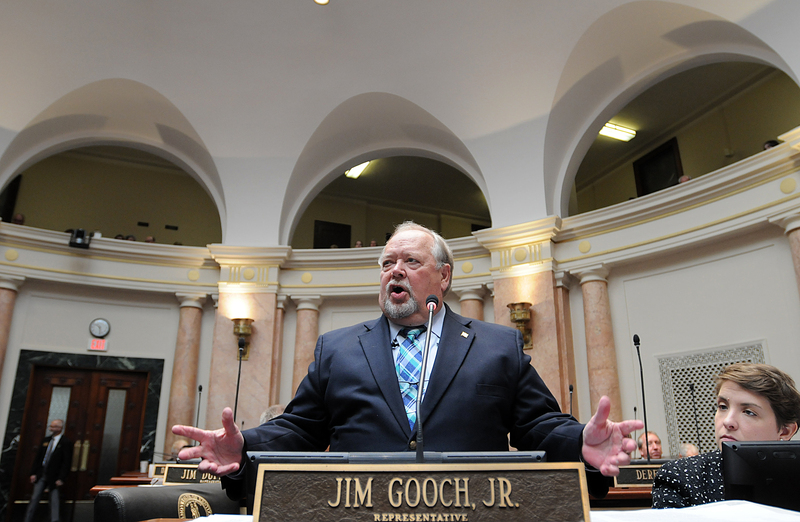 FRANKFORT, February 15 -- Rep. Jim Gooch Jr., R-Providence, speaks about Senate Bill 100, a bill regarding net metering, in the House. 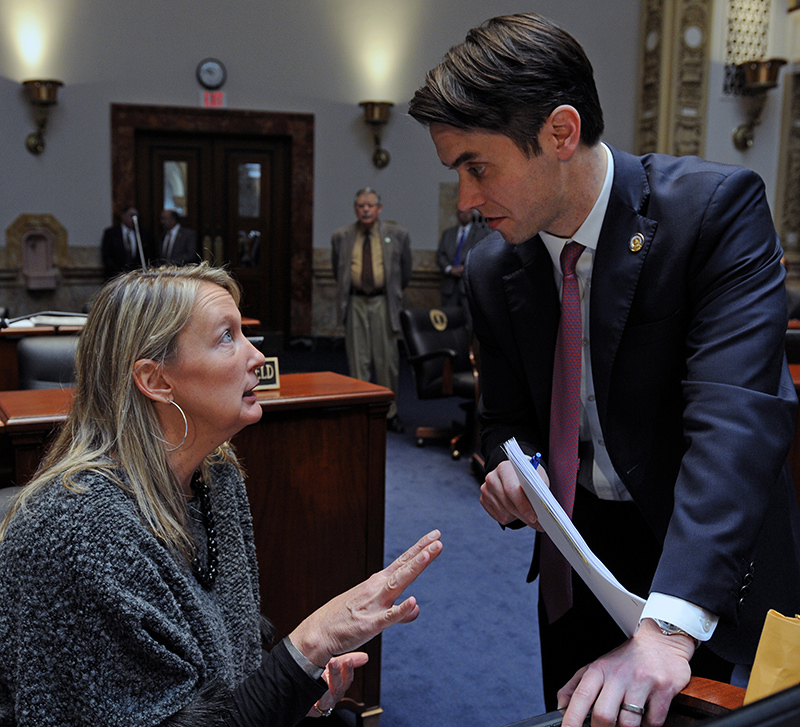 FRANKFORT, February 15 -- Senate Majority Caucus Chair Julie Raque Adams, R-Louisville, (left) speaks with Senate Minority Floor Leader Morgan McGarvey, D-Louisville, in the Senate. 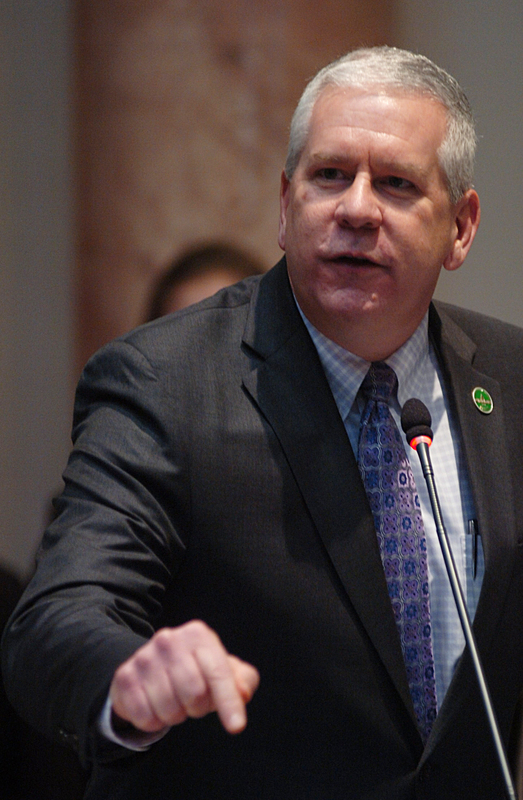 FRANKFORT, February 15 -- Rep. Tom Burch, D-Louisville, speaks on House Bill 148, an act relating to abortion, in the House. 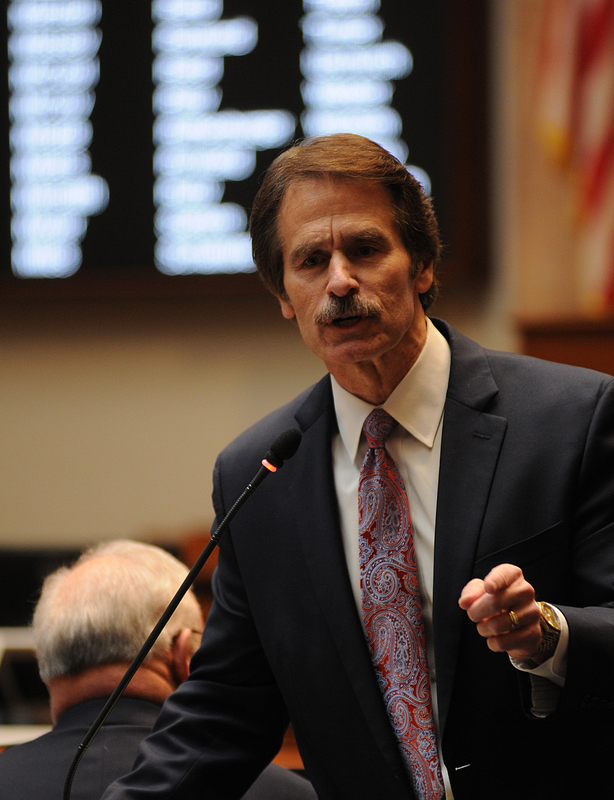 FRANKFORT, February 15 -- Rep. Stan Lee, R-Lexington, speaks on House Bill 148, an act relating to abortion, in the House. 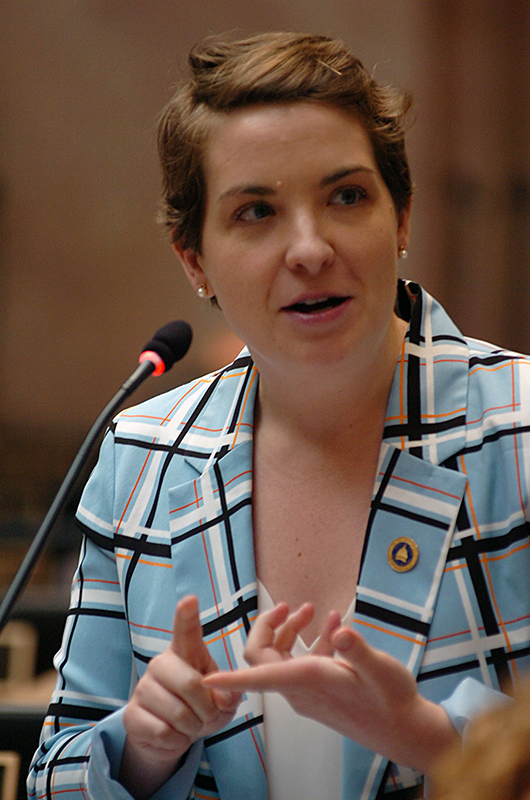 FRANKFORT, February 15 -- Rep. Kelly Flood, D-Lexington, speaks on House Bill 148, an act relating to abortion, in the House. 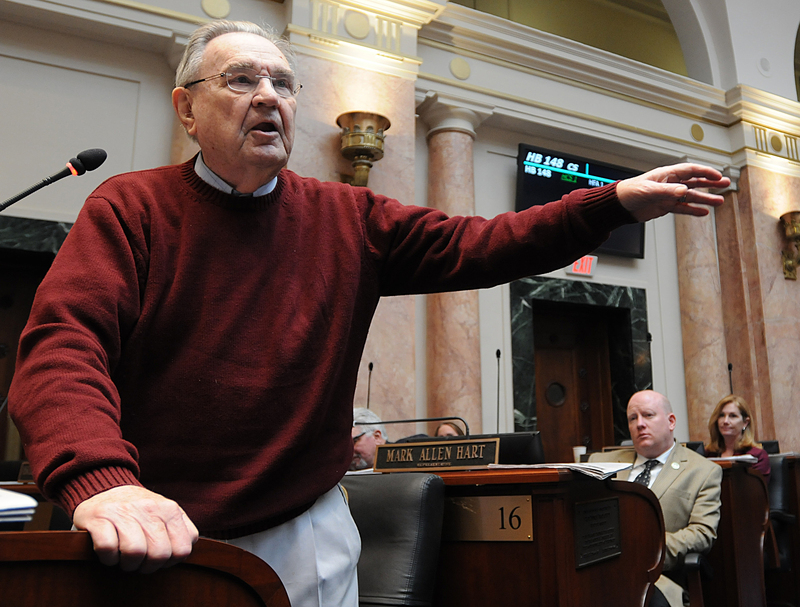 FRANKFORT, February 15 -- Rep. Jim DuPlessis, R-Elizabethtown, speaks about Senate Bill 100, a bill regarding net metering, in the House. 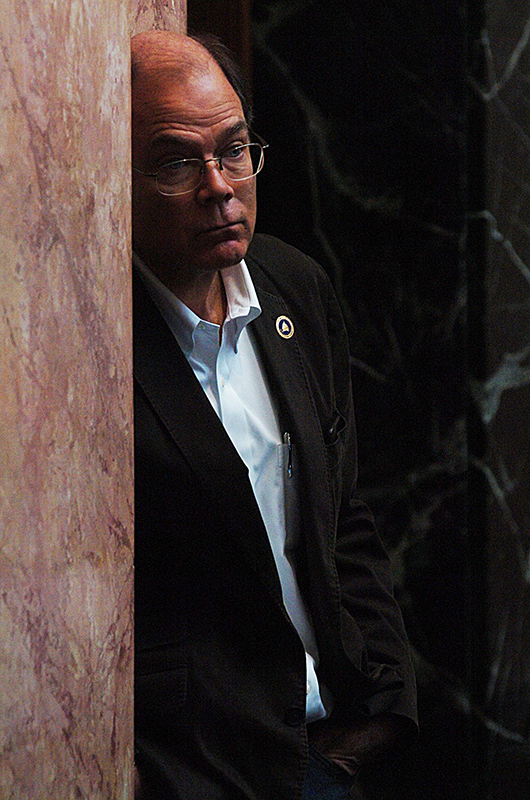 FRANKFORT, February 15 -- Rep. Joe Graviss, D-Versailles, listens to debate on Senate Bill 100, a bill regarding net metering, from the side of the House chamber. 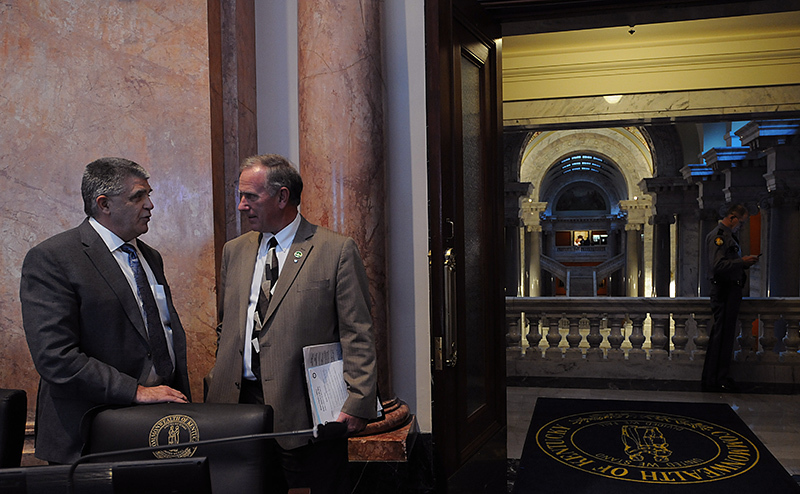 Photo Archives are in the process of being updated to match the look and feel of the current Legislature Homepage.